Apparently even when I'm looking for something else completely, the terrain bug is difficult to avoid. On a completely unrelated trip through the hardware store for a change, I came across a rack of plastic air conditioner ducting that included a bunch of pieces that immediately jumped out as potential building fodder. Before you could say 'Get to the bunker!' I was on my way home with fingers just itching to break out the tools. The end result was a brand new ground-level access for a bunker complex! The piece that I chose started out life as a 100mm ceiling cap, which is apparently something to do with air conditioners - I'm taking the word of the label for that! I love the idea of buildings that serve as an entryway to larger complexes below ground, and the shape of this fitting looked perfect for an atrium bunker leading to a staircase or angled lift shaft. As the type of plastic used was shiny and of indeterminate pedigree, I started out by removing the label and giving the whole thing a light sand with fine grade sandpaper to remove the glossy outer layer. This helps the glue and paint to stick later. 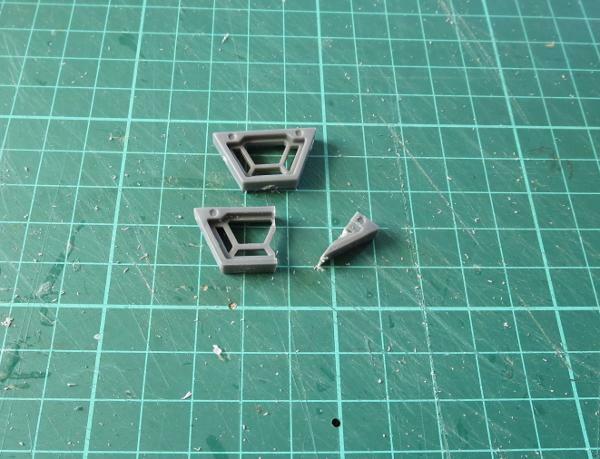 The fitting is made of two separate pieces that clip together along the sides, which made cutting window holes a little easier - I popped the pieces apart, and used a shutter window from the Maelstrom's Edge terrain sprue to trace around for the hole, with one vertical edge running along the seam. Then I cut along the top and bottom of the marked hole with a razor saw, and scored the other vertical side and snapped the resultant scrap piece out of the hole. This was repeated on the other side, and again on the front for a door hole, using the armoured door from the terrain sprue as a guide. I glued the windows and door in place using an 'all plastic' glue combo (a two-part setup that includes a tube of superglue and a 'primer' pen that is used first to help the glue stick to unusual plastics). I also added a strip light above the door for a little extra visual detail, and to cover over the screw hole that was there. To fill in the roof, I cut two pieces of 2mm foamed PVC to the right shape to fit in the cavity. 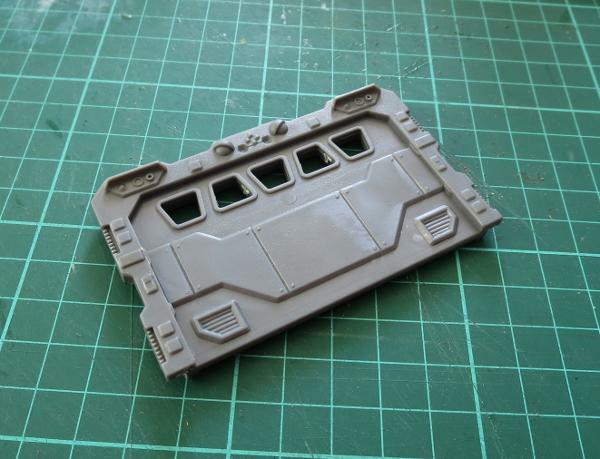 In one of these I cut a square hole for the hatch from the terrain sprue. The two pieces of PVC were then superglued together, and the hatch glued into the hole. The fitting has a couple of handy ridges running around in the top cavity at a perfect height to form a balcony once the PVC section was glued and dropped in to sit on them. At this point I also glued the structure down onto a piece of masonite cut to an appropriate size and shape, and filled in the seam on the fitting with a little putty. To paint, I started out with a coat of Rustoleum brown primer. I wanted some light texture over the non-metal parts of the bunker. For this, I used a terracotta paint found in the paint section at my hardware store. This is generally used on plastic plant pots to make them look like they're made of terracotta, and has a really fine grit mixed through it to give it a sandy feel. I used a large brush and dabbed this on rather than brushing, to avoid brushstrokes showing up when I drybrushed over it. The terracotta coat was a little patchy when it dried, with the dark brown basecoat showing through a bit darker than I wanted, so I went over it with a coat of Burnt Sienna craft paint. While that was drying, I also went over the base with a generous layer of PVA glue and sprinkled on a coarse sand and gravel mix. 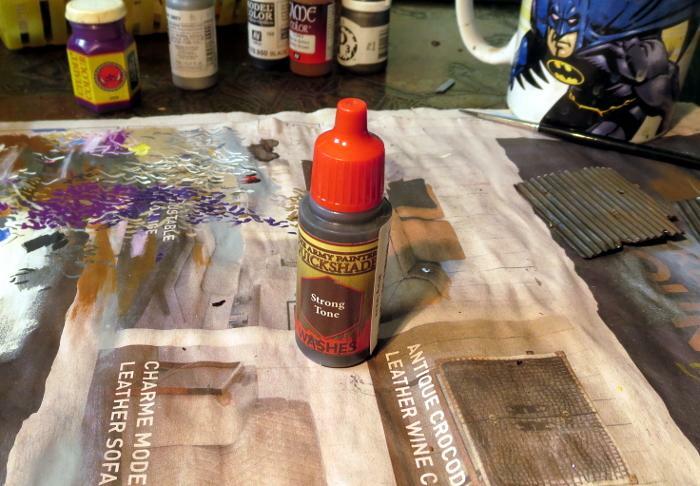 The bunker was then drybrushed with a mix of Burnt Sienna and a taupe colour (actually called 'Fawn' on the bottle). 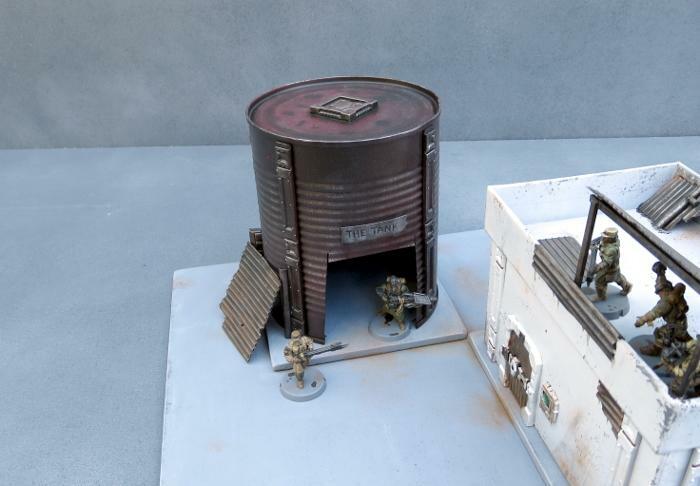 The metal parts were given a heavy drybrush with P3 Pig Iron and then a generous wash with Army Painter Dark Tone, and the base was painted with a dark brown (Burnt Umber) craft paint. Finally, the base was drybrushed with some more Fawn, and the lights painted with Citadel Ultramarine Blue, drybrushed with Ice Blue and White. I also added a building number on the back slope, using a stencil printed out on paper and cut out with a hobby knife. I dabbed on Vallejo Light Grey with a large brush, and then a layer of white, trying not to make it too neat so that it would look a little weather-worn. And that's it - ready for the table! 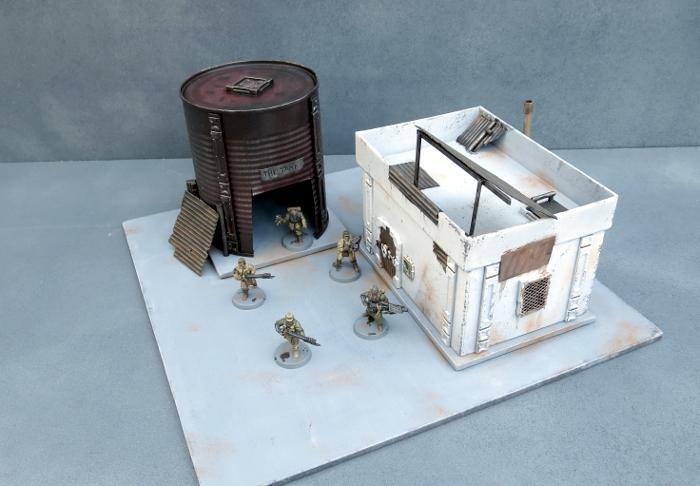 Build your own bunker by picking up the Maelstrom's Edge terrain sprue, along with the rest of the Maelstrom's Edge model range from the webstore here. 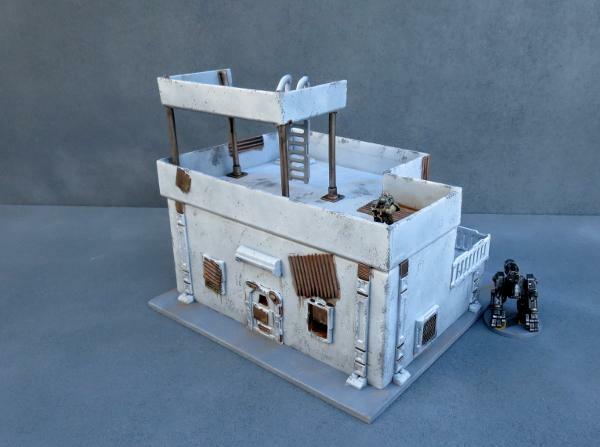 For other Maelstrom's Edge modeling articles, including tutorials and walkthroughs of a wide range of different building and miniature projects, check out the Hobby section of the Maelstrom's Edge website here. This all started, as I said above, with a 700g yoghurt tub. I was undecided at first as to just what to do with it, but when I went fossicking around in my potential terrain bits collection, I came across half of a plastic bauble that my wife bought a couple of years ago with Christmas stamps or somesuch thing in it. It looked a perfect size to combine with the tub, and so an idea was born. I decided to keep this one fairly light on extra detail, for a clean, functional-in-a-sciency-sort-of-way building. The first thing to do was add a door, so I grabbed one from the Maelstrom's Edge terrain sprue, traced around it on the side of the tub and then cut out the doorway rectangle carefully with a sharp hobby knife. 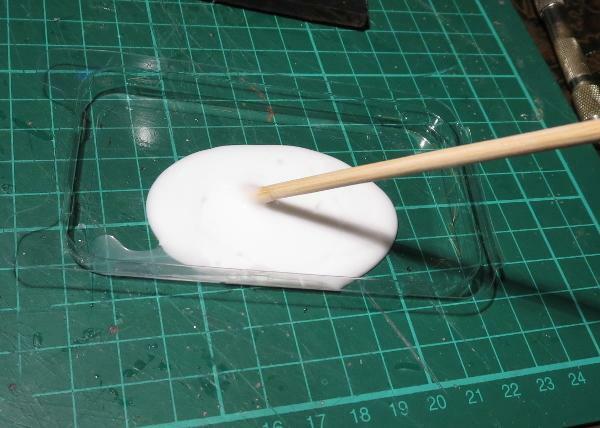 After checking the fit and making some slight adjustments with the knife, the door was glued in place with an 'all plastics' glue (a two-part superglue that includes a 'primer' to help the glue grab to plastics that can otherwise be problematic for a strong glue bond). I added three support struts spaced around the building, just gluing them in place where I wanted them. For the dome, I took some more support struts and separated the small square sections with attached rivet strips by cutting through the strut with the knife. I gave these a slight curve by bending them carefully over the handle of the hobby knife. On the bauble, I drew a guideline through the middle and then glued the strut sections and a large pipe fitting along the line. I then glued the bauble in place on top of the yoghurt tub, and added two more support strut pieces halfway around each side, to help reinforce the glue bond, as the edges of the bauble are fairly thin. Finally, I cut an 8" square of masonite, and glued the tub in the middle of it. I also added a couple of steps cut from an off-cut of foamed PVA, and a little strip of plasticard to cover over the doorstep, where my doorway cut had been a little untidy. 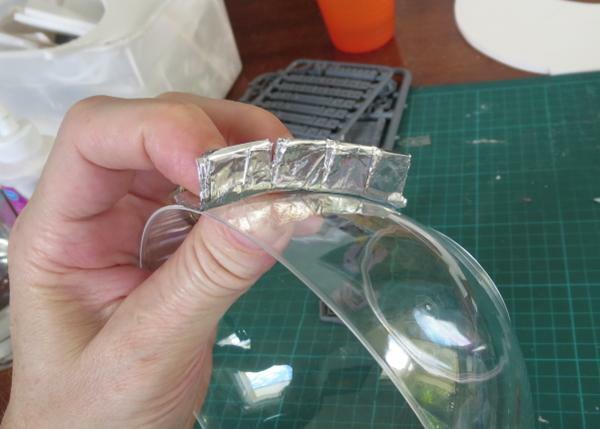 A quick tip on painting clear containers - it can be a really good idea, particularly if you are using lighter colours, to spray the inside of the container black or grey before gluing it in place and painting the outside. 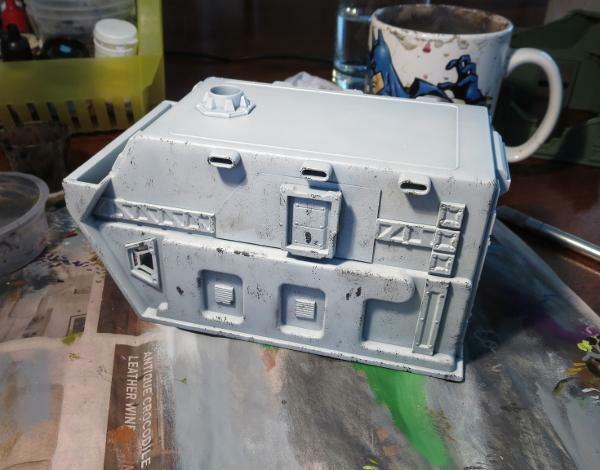 This helps to make the end result more opaque, as the painted building can otherwise go a slightly translucent or look a little glowy if there is a strong light behind it. 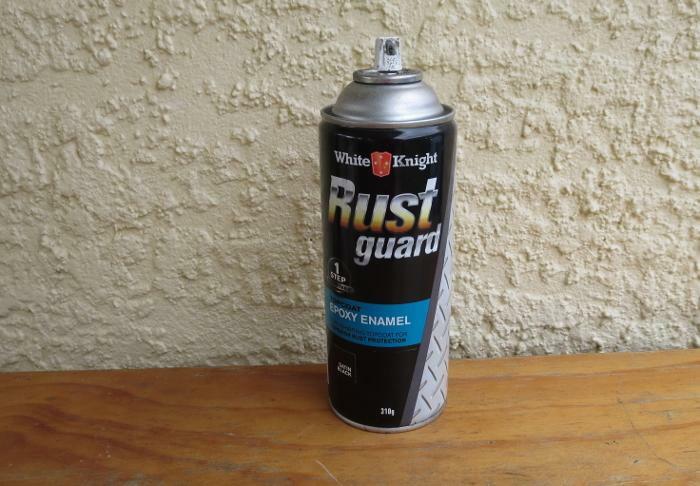 It also helps keep the building looking good if the paint gets scratched on the outside. 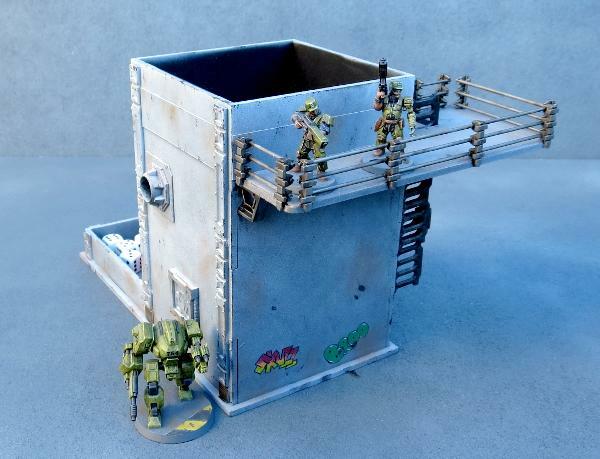 To build your own yoghurt tub science building, you can pick up the Maelstrom's Edge terrain sprue along with the rest of the Maelstrom's Edge model range from the webstore here. One of the most enjoyable aspects of terrain building for me is to find everyday things that, with a little bit of tinkering, suddenly turn into something that looks at home on the battlefield. This has resulted in me spending more time than is healthy wandering through hardware stores and discount shops looking for new fodder for the workbench - it's often a little surprising where that perfect next project piece will show up. This week's build is based on an idea that I have come across in several different incarnations online, and thought it looked too cool to not try it out. So after a quick trip to the local grocery store, I found myself building a generator out of bubblegum tape dispensers! I picked up two packs of grape-flavoured Hubba Bubba. Obviously, the flavour doesn't make any difference to the build, but if you're buying bubblegum anyway, is there any logical reason to buy any flavour other than grape? The first step was to remove the bubblegum from the packs, and remove the labels. The labels mostly peeled off easily, but needed a little cleanup with some Tea Tree Oil to remove the sticky residue - If you don't have access to Tea Tree Oil, use whatever local equivalent you have for cleaning sticky residue off things. One side of the pack has an internal ridge running down each long side of the opening, and a pair of tongues that close over into the other half. These needed to be removed, which I did with a sharp exacto knife. They're made from a fairly soft plastic, so cut easily. This left four almost-identical, semi-circular pieces. 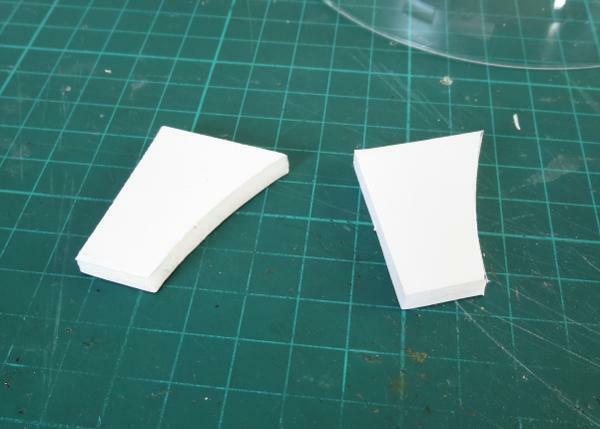 To join the segments together, I took four 25mm bases and cut them in half with a razor saw. 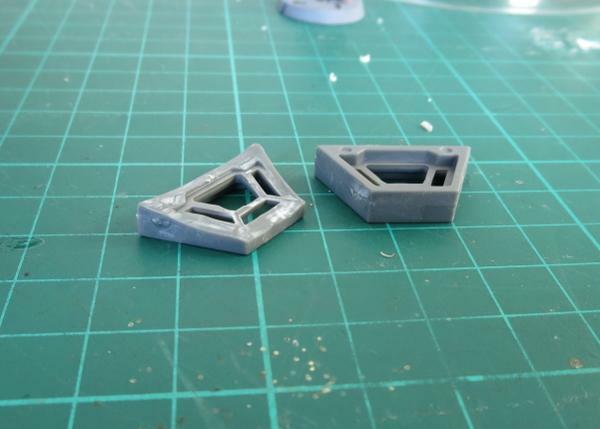 The arc markers on the Maelstrom's Edge bases serve as a handy guide for this, but if you are using different bases then some measuring and marking would be involved here. I cut a piece of masonite to an appropriate size for a base, and then a smaller piece of foamed PVC for the generator to sit on. I could have used another piece of masonite here, but figured the plastic gum dispenser would glue better to the PVC. On the PVC, I marked out where the dispenser pieces would sit, and added a 25mm-wide centre strip to serve as a guide for gluing the base pieces on. Then, I sat each dispenser piece in turn onto the marks and glued the base sections in position on both sides using an all-plastics glue. (The 'all-plastics' glue that I use is a 2-part system that has a tube of superglue and a 'primer' pen. 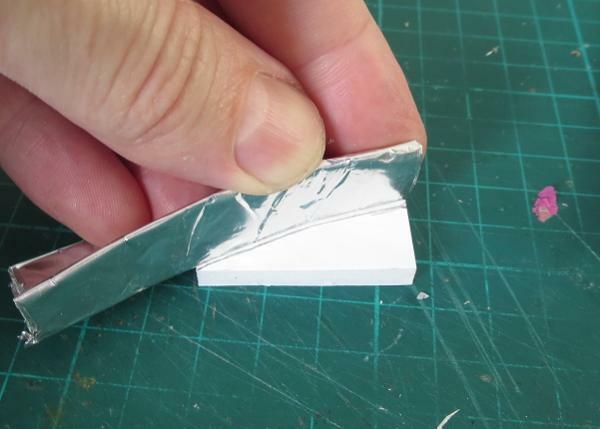 You prime the contact points on both parts to be glued before applying the glue, and it creates a super-fast and extremely strong bond with just about any type of plastic). It was around about this time that I noticed that there were small recycling symbols embossed on two of the dispenser pieces, so I carefully shaved these off with the exacto knife and lightly sanded down the surface. Then I moved on to the ends. Due to the dispenser having that tongue that I cut off back at the start, one side was left with a flat plate, while the other had a hole where the tongue originally slotted in. I took the cut piece of tongue and glued it into this gap. 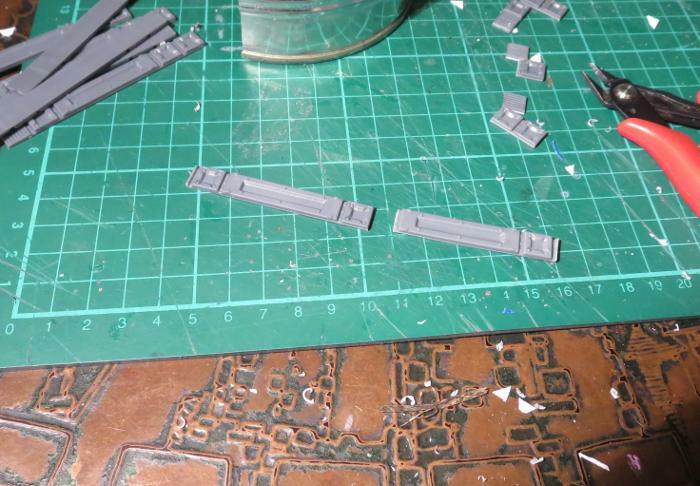 Then I took eight support struts from the Maelstrom's Edge terrain sprue, and cut off the vent sections on their ends. These were glued in pairs into the dispenser opening. The four sections of dispenser were then glued down onto the base, with the 25mm base sections on each touching the matching section on the next. 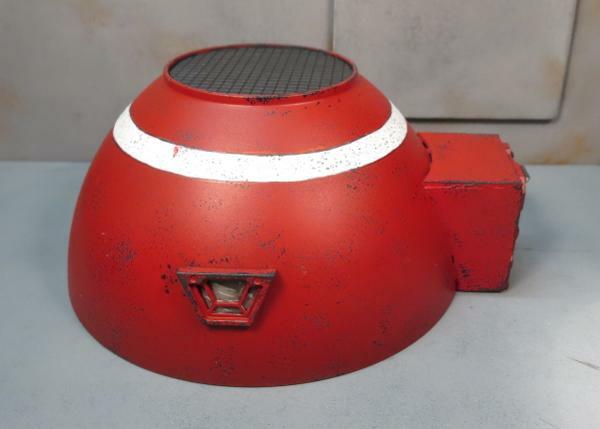 I felt that the generator needed a control panel, so quickly threw one together using a console and two trapezoid windows from the terrain sprue, with a square of foamed PVC as a base. With that glued in place onto the masonite base, the generator was ready for some paint! I painted it up using my normal weathered metal technique (which you can find in the tutorial here). 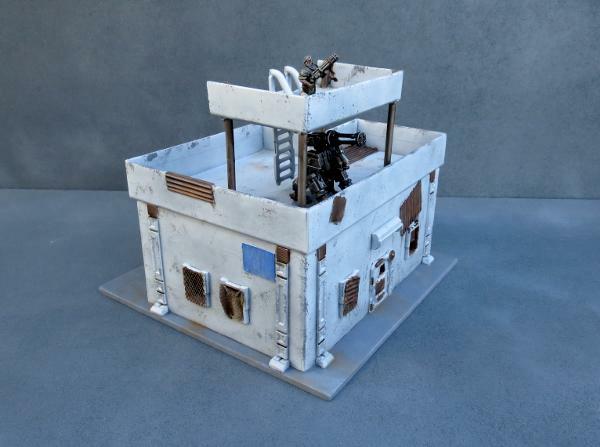 To build your own generator, you should be able to find the bubblegum tape just about anywhere that sells bubblegum, and can pick up the Maelstrom's Edge terrain sprue along with the rest of the Maelstrom's Edge model range from the webstore here. 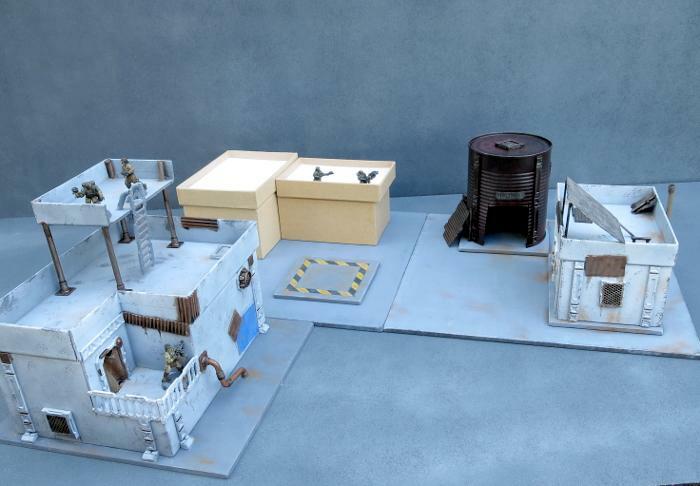 The Maelstrom's Edge Terrain Sprue contains a slew of assorted plastic bits and pieces that can be used to pretty up your home-made scifi terrain, including a bunch of essential elements like doors, windows and pipe fittings. 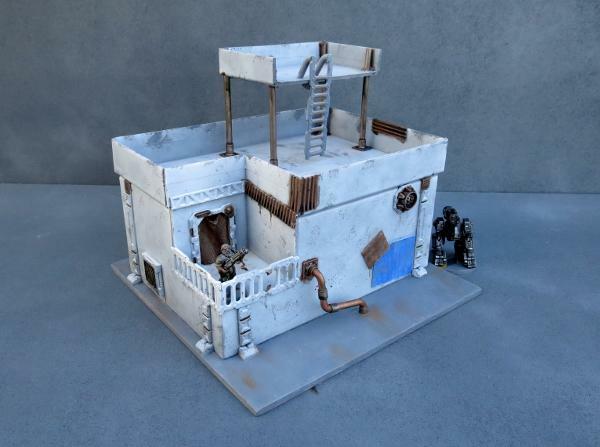 This week, I'd like to share a few tips and tricks for squeezing a little extra versatility out of the terrain sprue and adding some extra touches of detail to your buildings. The terrain sprue in all its glory! 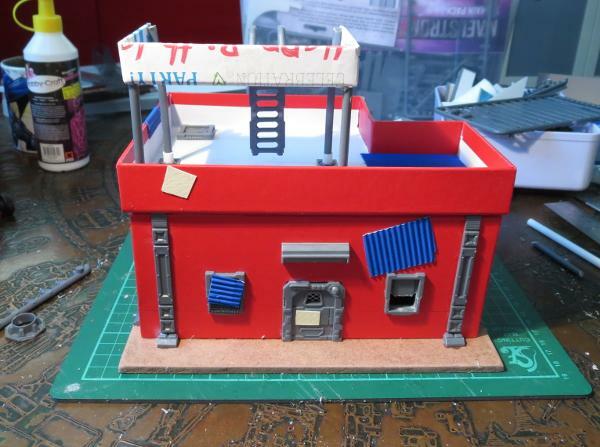 While it's loaded with all sorts of interesting bits that can be clipped off and glued on to your buildings as-is, a little careful cutting and some extra materials will go a long way towards adding that extra detailing that helps to finish things off just right. The join the marks across the circle, and along each of the resultant radial lines make another mark 2mm out from the centre. Then cut out the circle, and cut inwards along each radial line up to the inner marks. Dry-fit it inside the pipe fitting to make sure it goes in, and sand around the edge if necessary so that it goes in easily - you don't want a tight fit, as it will deform slightly in the next step. Now gently twist each of the segments around the circle to create a fan shape. 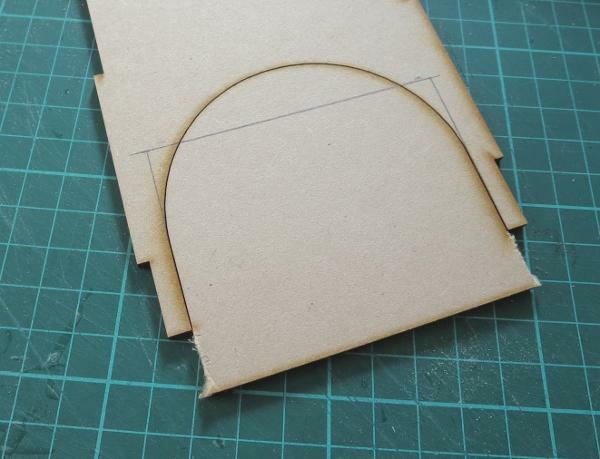 If you're using plasticard, go gently here to avoid snapping it - cardboard is a little more forgiving at this step. Obviously, you also need to make sure that you twist each segment the same way, otherwise your fan is going to run into some operational issues. Your fan blade can now be glued in place inside the pipe fitting by applying a small amount of superglue around the edge and pushing it into place. You'll need to cut a small hole in whatever surface you're mounting this on for the rotor assembly to sit in, so that the pipe fitting can sit flush. I always try to look out for ways to make use of all of the leftover sprue that builds up from all of those plastic projects. 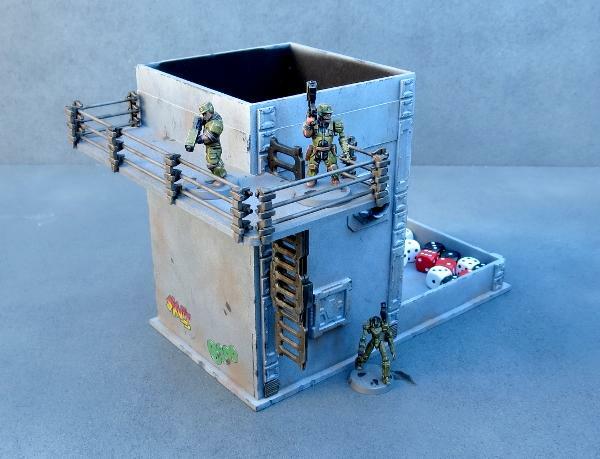 The round sprue used on this terrain set is particularly useful with just a little help from some plastic tubing. 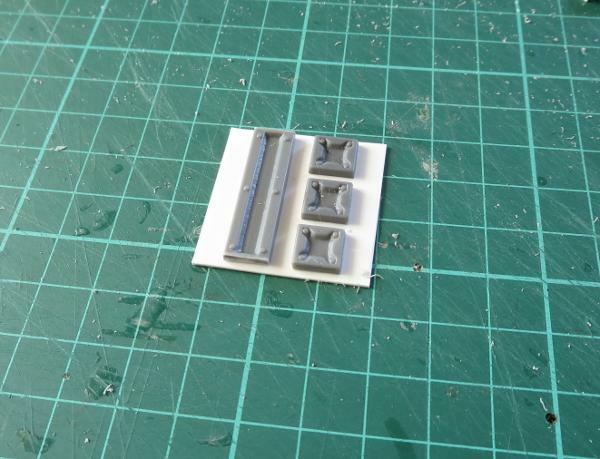 Take the small pipe fitting, an 'L'-shaped piece of the thinner side of the terrain sprue, a square cut from the bottom of one of the support struts, and a couple of short pieces of 7mm (1/4") plastic tubing (Plastruct, Woodland Scenics or the like). 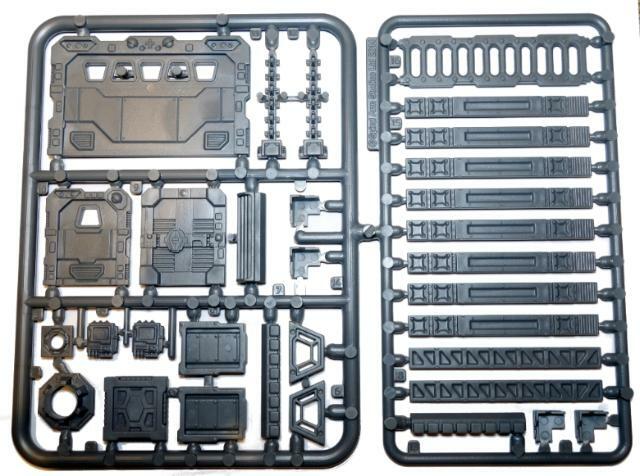 This can be then glued in place wherever seems appropriate, and can be easily reconfigured to match your terrain using different combinations of sprue sections and/or extra bits of tubing or support strut sections. Take a door, and three support struts. The glue them in place around the back of the door frame. The strut piece from the top of the diagram goes along the top, and the other two (which, unless something's gone horribly wrong, will be identical) go down either side with the rivet strip at the top. This can then be glued in place on the wall of whatever you're using to make your building, with no cutting of the wall required. These are just a few ideas that I've found useful when constructing terrain. One of the great things about a product like this is the more-or-less limitless possibilities opened up through the ease of working with plastic components and the open-ended nature of the construction allowed by it. It's always great to see people take the sprue and find new and unexpected ways to use the components on it. So why not give it a go? You can pick up the Maelstrom's Edge terrain sprue along with the rest of the Maelstrom's Edge model range from the webstore here. Slightly unusually for my projects, I started this one by sketching out a plan to see how everything would fit together. This was partly due to my desire to take advantage of the flexibility of the PVC by adding a curved front wall to the building, so I wanted to make sure that I had my dimensions correct before I started cutting. Once I was confident that I had it all worked out, I pencilled up the various panels that made up the building onto the sheet of PVC, and then used a steel ruler and hobby knife to cut it all out. The foamed PVC cuts really easily with a knife, and also sands well. 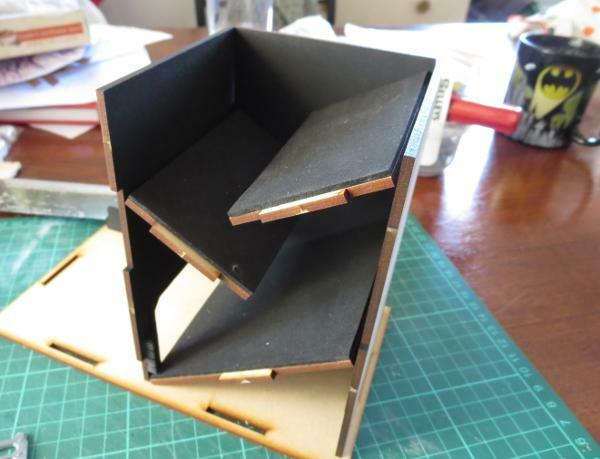 It feels almost like something halfway between cardboard and foamcore*, without the inherent frailties, like the risk of damage from moisture or spraypaint. 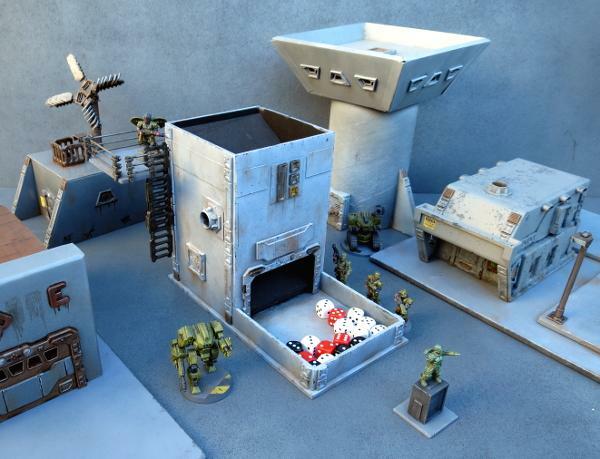 *For the uninitiated, Foamcore, also sometimes called Foam Board, is a material made up of a thin sheet of expanded polystyrene sandwiched between layers of paper or thin card, and is a common building material for wargaming terrain and scale building construction. Once everything was cut out, I did a quick dry-fit to check that everything slotted in where it should. 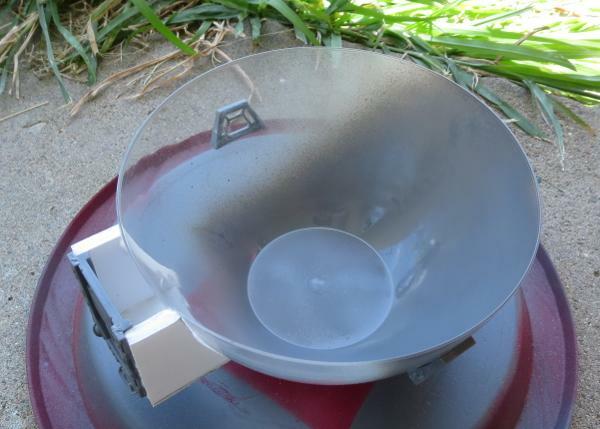 The curved panel on the front was made by cutting the piece to the right size and then laying it over an old baby formula tin while heating it with a hair dryer. This achieved the desired curve, but I suspect the hair dryer was a little too hot for the material as it caused it to swell on some of the cut edges. Next time around, I'll try just immersing it in hot water for a minute instead. 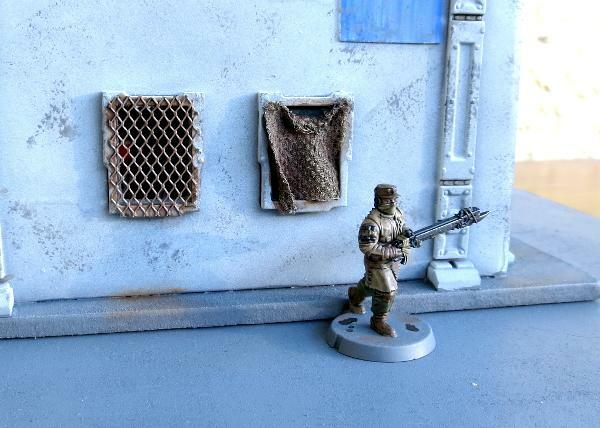 The door and windows are taken from the Maelstrom's Edge terrain sprue. I cut the holes in the wall panels for those by sitting them in place, drawing around them with a pencil, and then cutting the resultant rectangles out with a hobby knife. 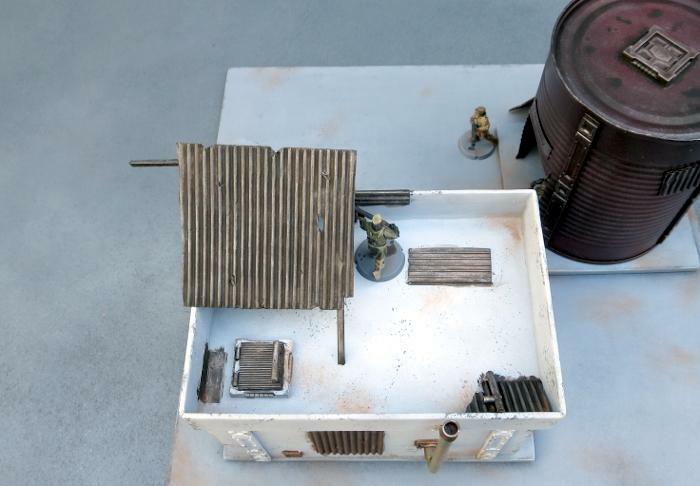 I wanted a walled roof area for troops to take cover on, so marked down 20mm inside each wall and glued in some strips of leftover PVC to act as support. The walls, door and windows were all glued into place, and the roof dropped into place with a little more glue. I used superglue for assembly - this grabs really well, and quite quickly, on the foamed PVC. As the last step before painting, I took support struts from the terrain sprue and glued them over the exposed joints on the walls. That left me with the building itself assembled, and a few details to add on once the walls were painted. 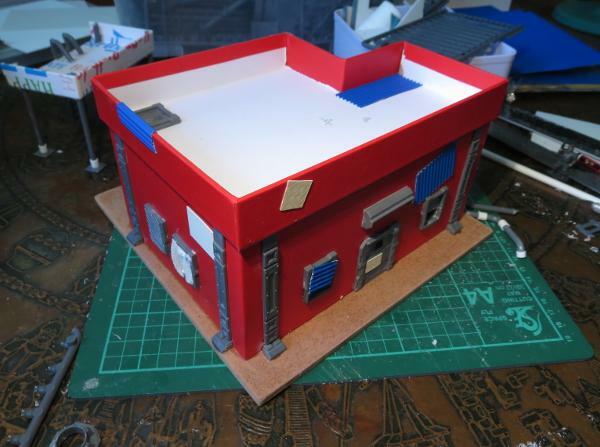 For some added sturdiness, I glued the building down to a square of 5mm masonite. To kick off the painting, I sprayed with red right around the top of the walls. 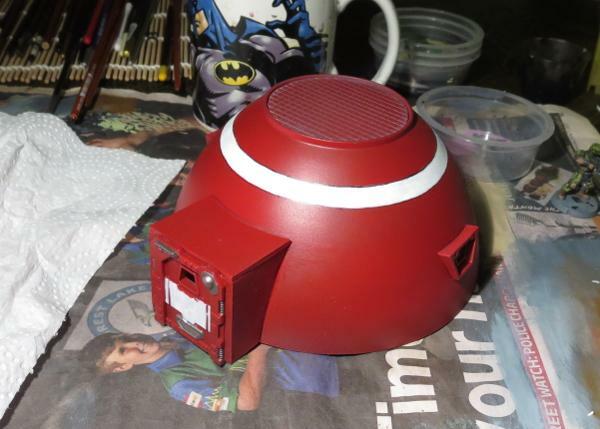 I then applied a line of masking tape over the red paint, just below the tops of the walls. I lined this up with one of the panels on the support struts, to make it look neater. The whole building received a coat of a nice, sandy brown colour. This was followed up with a spray of white from above, leaving the sandy brown in the crevasses and undersides of the detail. 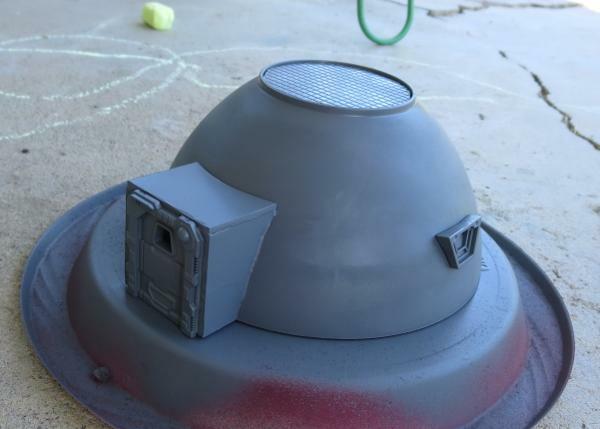 Once the spray was dry, I peeled off the masking tape, and painted the base and the roof with Vallejo Basalt Grey. 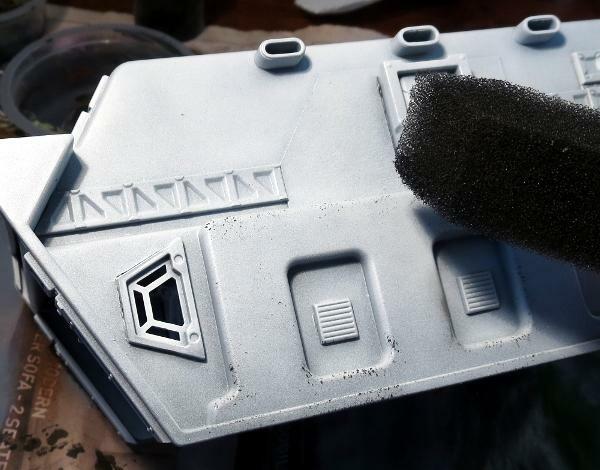 Everything was weathered with a sponge and some Vallejo Heavy Charcoal (for a how-to on sponge weathering, check out the article here! 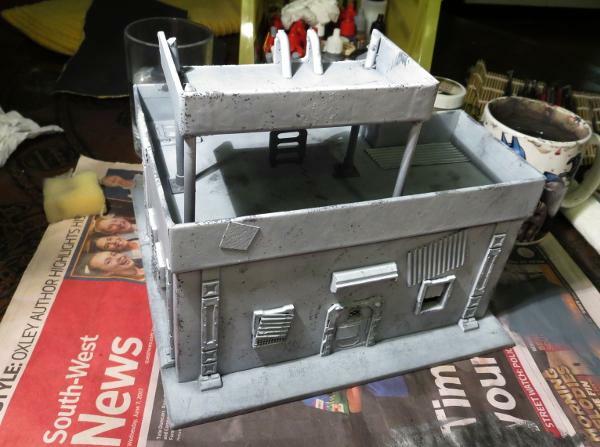 ), and the base and roof were drybrushed with Vallejo Light Grey and a little white. I dirtied everything up with a generous drybrush here and there with Vallejo Beasty Brown. The lower edges of the weathering on the red strips was highlighted with a little Citadel Tentacle Pink and Army Painter Pure Red, and I blacklined some of the deeper detail lines on the terrain sprue components. 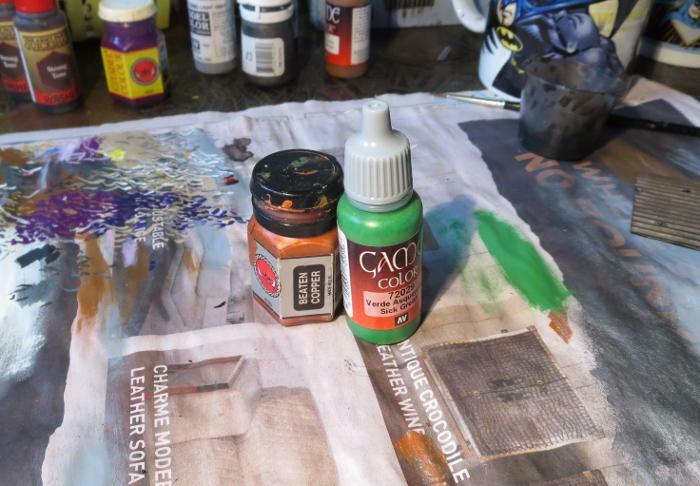 The 'puddle' stains were added with Army Painter Strong Tone and Dark Tone, by dripping small drops onto the board and leaving it to dry. For the finishing steps, I added a fan on one wall using the large pipe fitting from the terrain sprue some plasticard, built a small pipe coming out of the back wall using some more terrain sprue pipe fittings, a couple of short pieces of plastic tube and a piece of sprue cut from the terrain sprue, and hung a ladder on the back wall. To add handrails to the top of the ladder, I trimmed away the top rung, and cut a couple of pieces of sprue that looked about right, added a ninety-degree bend with by bending carefully with pliers, and then gluing it all in place. The ladder was painted using my normal weathered metal technique. You can pick up the Maelstrom's Edge terrain sprue along with the rest of the Maelstrom's Edge model range from the webstore here. A few weeks ago, I picked up a couple of packs of scifi shipping containers from a company called 'Laser Cut Card'. 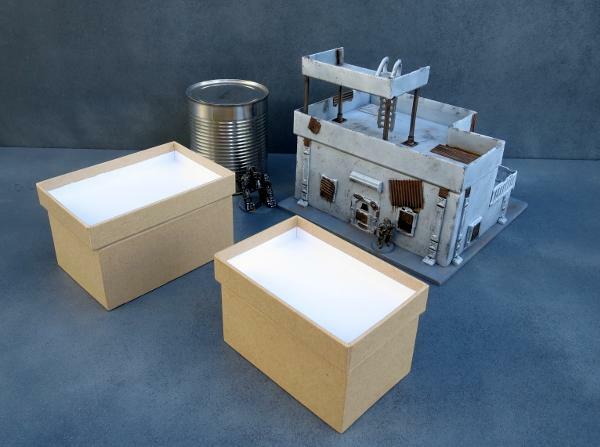 They produce a range of different vehicles and building kits that are laser cut out of stiff cardboard, which are much cheaper and easier to work with than the more common MDF kits, and are surprisingly sturdy when assembled. I built four of the six containers I received as normal shipping containers, but then couldn't resist doing something a little different for the fifth one. 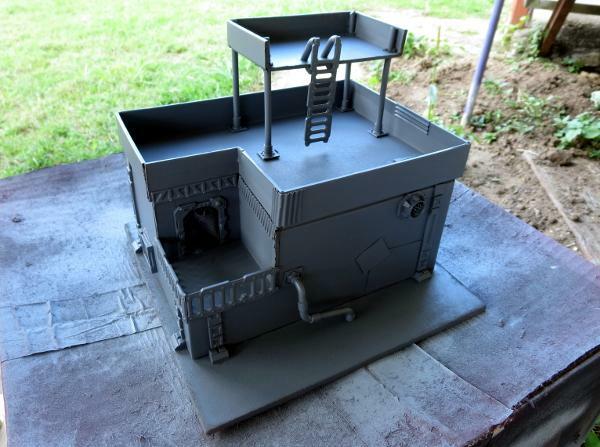 And so for this week's modeling spotlight, I'm running through the construction of 'Honest' Pete's Trading Post! 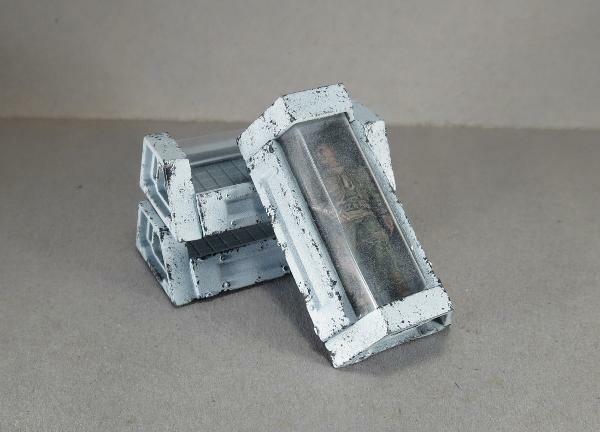 The shipping containers come flat-packed in a set of three, with some pictorial building instructions on the back of the package insert, but assembly is essentially to roll a sheet of pre-scored card into an octagonal tube and then glue other bits onto the outside of it. I assembled mine with superglue, although you could use wood glue if you wanted to allow a little more working time to make sure you have everything lined up. Obviously this wasn't going to be a particularly large shop, so the idea was to have a servery-style counter and awning rather than have customers go inside. So I began by cutting one of the large sections off the main body piece of the container, and then gluing the ends on to the result sideless tube. A shop needs somewhere to put their merchandise, so I threw together a set of shelves from thin plasticard, to run along the back wall of the container. An angled bottom on the uprights allowed the shelves to sit flush against the container side. Next up I cut another couple of strips of plasticard to create a counter, about a third of the height of the space in the container wall, and glued this in place. 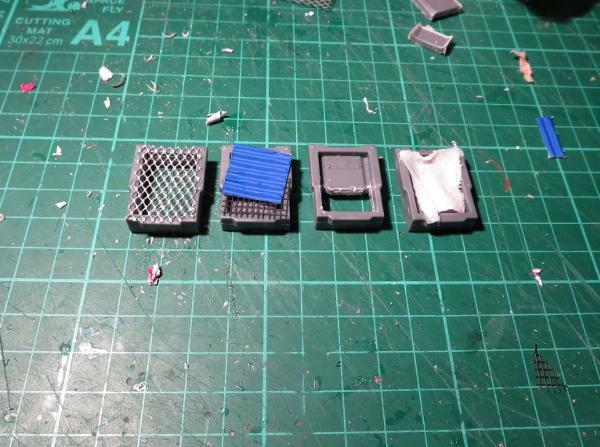 For the finishing touches, I cut some 'concrete' stands for the container out of 5mm foamcore. These serve to lift the container up very slightly to allow a little extra head-clearance for the awning, and make the structure look more stable. 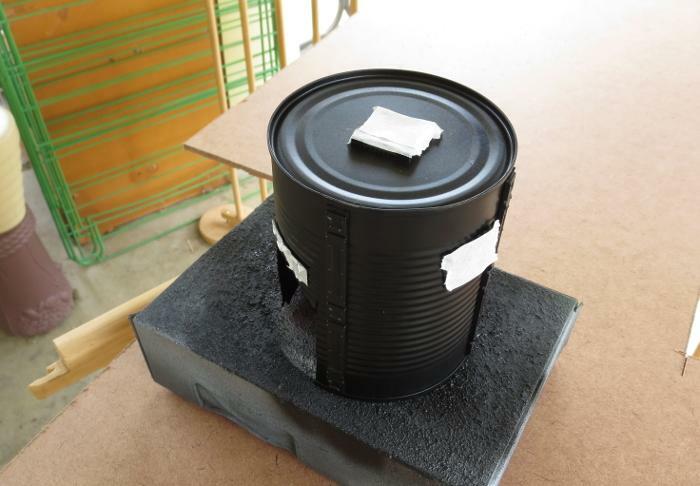 The exposed foam center was sealed with a generous coat of PVA glue so that it wouldn't dissolve when hit with spray paint. I added some corner reinforcing to the bottom of the front edge of the awning piece using some scrap card pieces, and built some corner support posts using the small pipe fitting from the Maelstrom's Edge terrain sprue, some plastic tube and a couple of lengths of plastic cut from the sides of the terrain sprue itself. 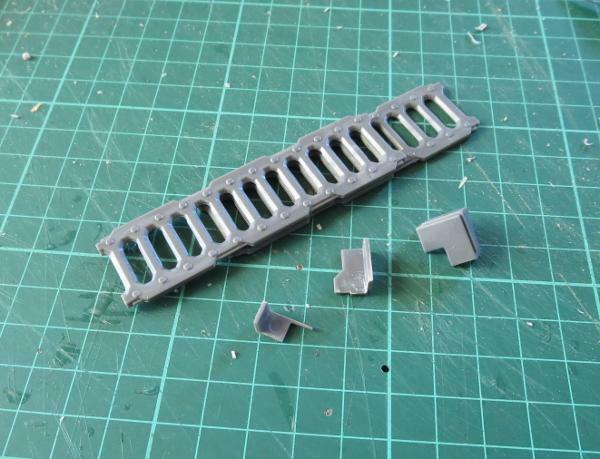 Finally, I took a large pipe fitting from the terrain sprue and added a fan cut from a piece of thin plasticard. I trimmed the edges of the pipe fitting away so that it would fit neatly over the circular detail on the roof of the container. The sign on the awning was a last-minute addition. 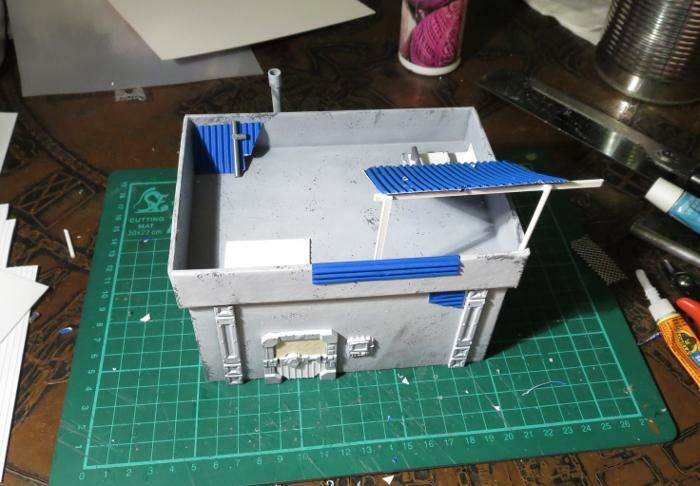 I was originally going to have the trading post sign on the front of the counter, but realised that this wouldn't be hugely visible on the gaming table, so built a quick rooftop sign from some more scraps of card. I also added a mesh grill above the counter after painting inside the container, to make the interior of the store less accessible. 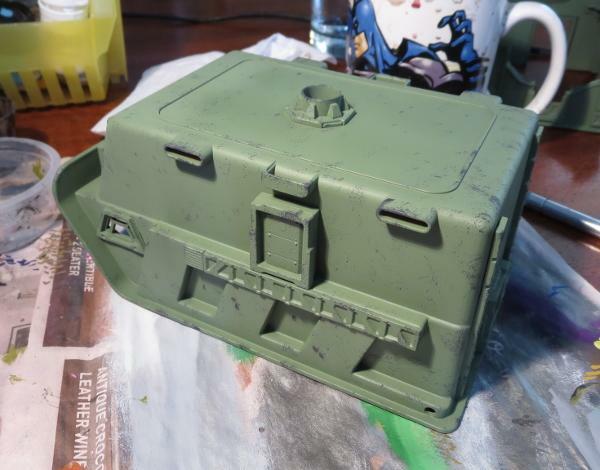 The container was sprayed with black and then Army Painter Army Green, before being sponge-weathered with Vallejo Heavy Charcoal and dirt weathering drybrushed into the creases with Vallejo Beasty Brown. 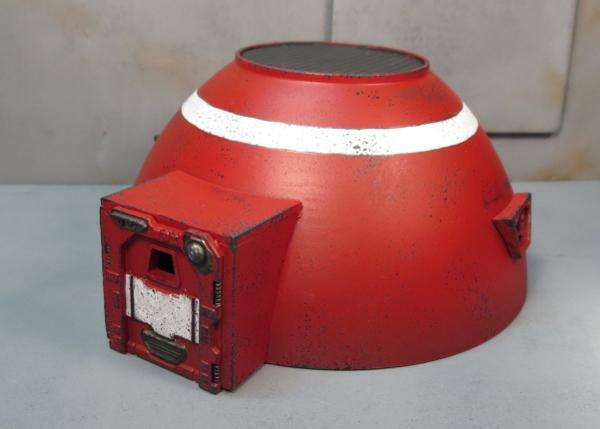 The text for the signs was created in Gimp, printed, and glued on prior to weathering so that it would match the rest of the container. I added grafitti on the back and sides of the container to give it a little character and to make sure that all the interesting bits weren't on the front. The grafitti was sketched in with a black fineliner pen, and then painted in whatever colours seemed appropriate. The roof was left plain, with just the weathering to break up the green. As an extra little detail, I printed up a shipping carton and some bottle labels using Gimp, adapting the fronts I made for my Vending Machine templates a few weeks back (article here). 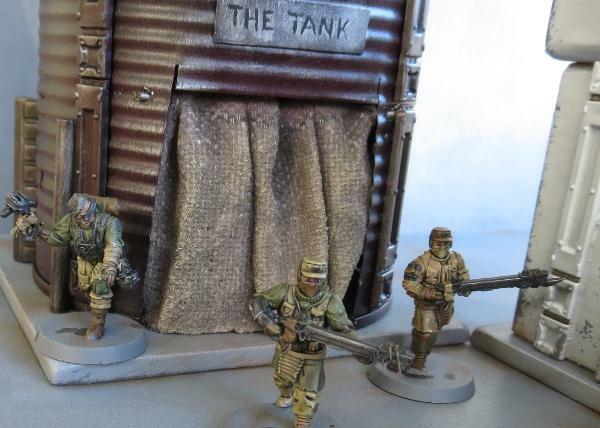 The shipping carton was cut and folded, and then weathered with a little Army Painter Soft Tone, while the bottle labels were glued to some bottle bombs taken from the Broken Infantry weapons sprue with their rag wicks cut off. And with that, 'Honest' Pete's is ready for the table! On one of my periodic rambles through the plumbing department at the local hardware store (because how else would I spend my weekends?) I came across some pipe fittings that I thought would be just perfect for some different line-of-sight-blocking terrain to break up the sea of square buildings on my urban table setup. 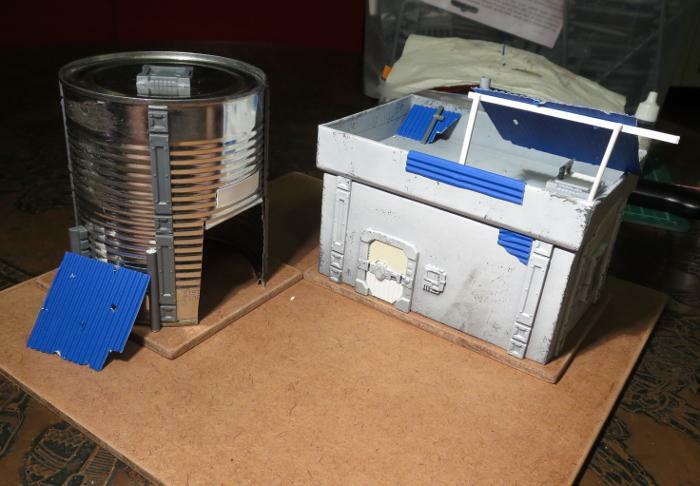 With the addition of a couple of old computer fans and a few components from the Maelstrom's Edge terrain sprue, I had a trio of cooling towers ready for the table. The part that I used for the main body of the tower is a 'round socket downpipe' intended for rain guttering on a house. As the downpipe is made of PVC, and is quite shiny, I started out by giving it a light sand with some fine grade sandpaper. This provided a better surface for glue and paint to adhere to, and also allowed me to remove the embossed manufacturer logo on the side. 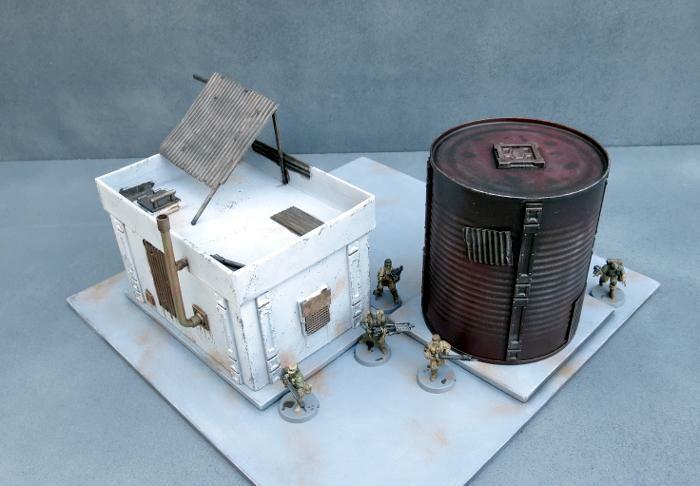 Cooling towers tend to be largely featureless constructions of plain concrete, but that's a bit boring for a gaming table. So I grabbed four reinforcing struts from the Maelstrom's Edge terrain sprue, and chopped off the two square sections from the end, so that the remaining length would fit neatly onto the wider portion of the downpipe. Then I glued the pieces on using an 'all plastics' superglue, which is a two-part superglue that has the normal glue plus a 'primer' that goes on first to help strengthen the bond. For a more flush fit, I could have sanded down the side of the downpipe where the strut pieces would sit to form a flat strip on the curved surface, but the struts are narrow enough that the gaps that result from gluing them straight to the curved side aren't really noticeable, so I didn't bother. 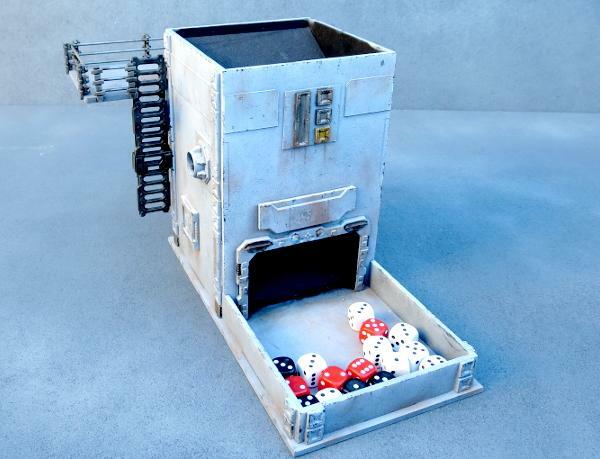 To add some detail to the inside of the tower, I dug out an old computer fan from my box of assorted 'probably use this for terrain one day' rubbish hobby material. Using a pair of heavy-duty clippers, I snipped through the struts that held the case on the outside of the fan. 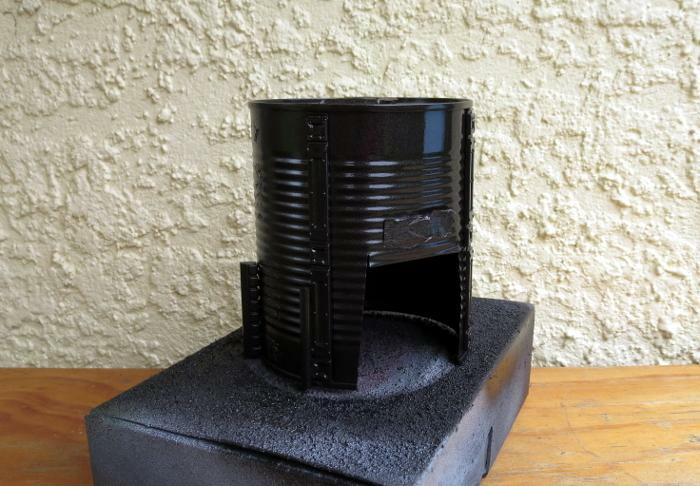 On the inside of the downpipe, there is a ridge where the thinner and thicker sections meet. I cut a piece of 2mm thick plasticard to fit neatly onto that ridge, providing a platform for the fan to sit on. I glued the plastic strip in place, but left the fan unglued for now, to make painting easier. Painting went through a process that is probably familiar to anyone who has been following these articles. I started by undercoating with flat black spray. Next I sprayed with a medium grey, and to add some texture to the flat surface added a light spray of light grey while the first coat was still wet. This creates a nice, dappled, concrete-like effect. As I only had gloss grey sprays on hand, once the grey was dry I gave the tower a generous coat of Testors spray lacquer. 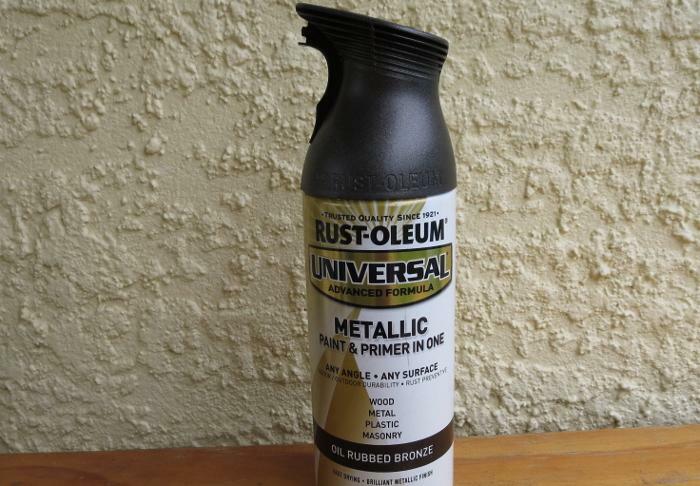 This both kills the gloss and protects the paint from scratching off the PVC as easily. ...and finally a wash of Army Painter Strong Tone. 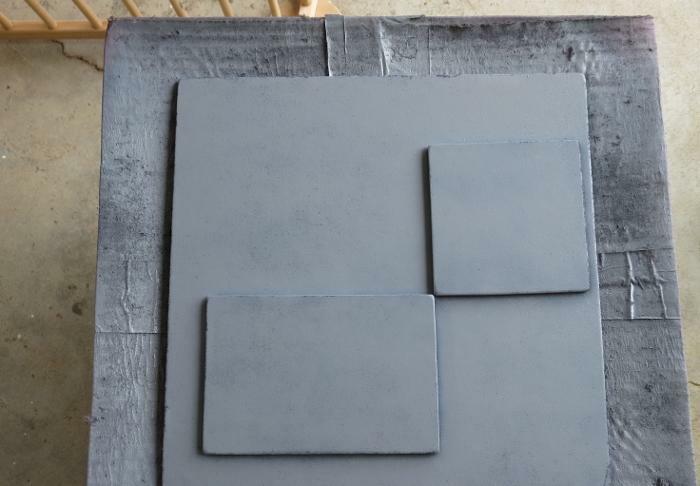 While all of this was going on, I also cut a square of Masonite for a base, sprayed it grey, drybrushed with light grey and white, and added some hazard stripes that I created in Gimp and printed out. 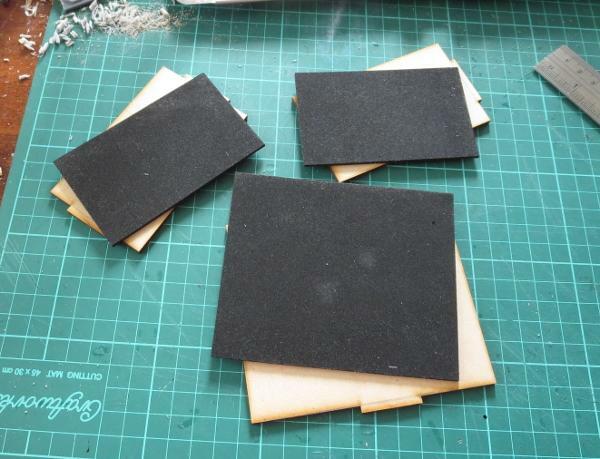 These were glued in place with PVA glue, and then weathered with a sponge and some medium grey (you can find a tutorial on sponge weathering here). 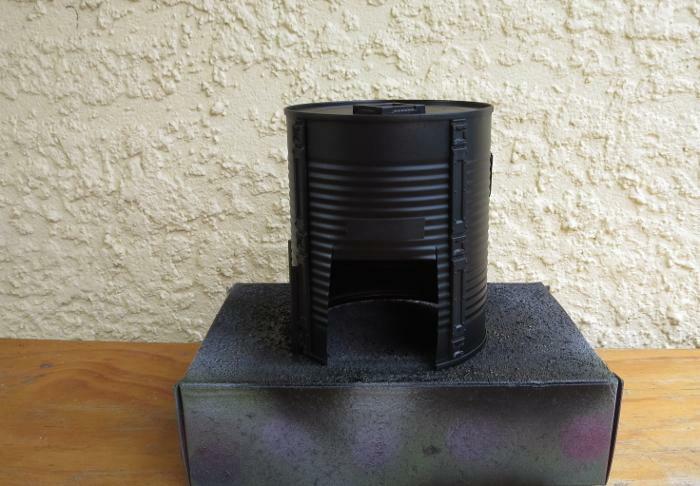 The fan was sprayed with some Rustoleum Aged Brass, and then given a light drybrush with Pig Iron, before being glued in place inside the tower. The tower was glued onto the base - I lightly sanded the bottom of the downpipe to remove any spray paint, and then used the 'all plastic' superglue again. Finally, some weathering was added with a large drybrush and some more Beasty Brown. I had bought three downpipes, but found that I only had two computer fans that matched. Rather than use a mismatching fan in the third tower, I decided to make one battle-damaged by cutting away a chunk of one side. 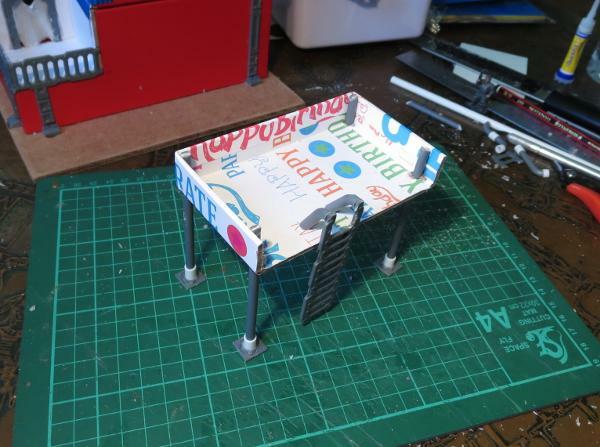 I left a part of the fan platform to provide a place for a model to stand, and glued the pieces of the tower side inside and underneath the platform to give it some support. Obviously the tower was hit with some sort of implosion device, or a cleanup crew sorting out the damaged tower just threw all of the rubble inside to get it out of the way until the tower could be replaced. 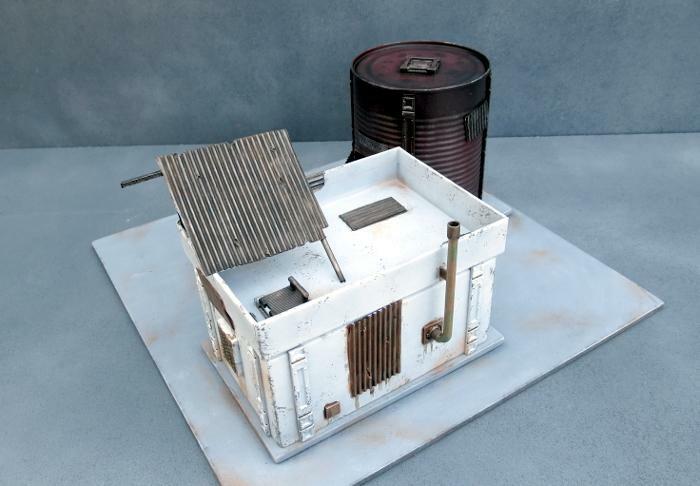 To build your own cooling tower, you can pick up the Maelstrom's Edge terrain sprue, or any of the rest of the Maelstrom's Edge model range, from the webstore here. 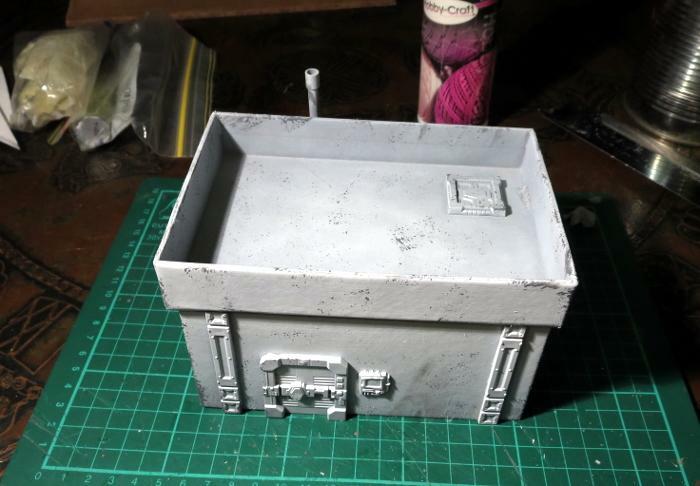 It's been a few weeks since I built any terrain and I'm starting to feel withdrawal symptoms, so this week I have busted out the foamcore and terrain sprues, raided the recycling bin, and built a quick little storage tank for my newly assembled elite Epirian SecDef units to hide behind. 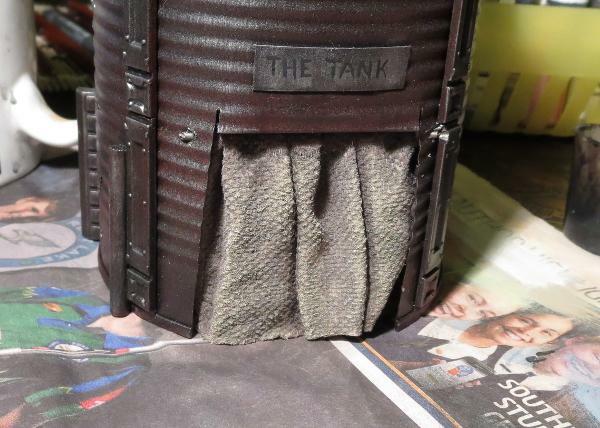 The main body of the tank is made from a small Pringles can. This of course requires you to remove the Pringles from said can, which my wife was happy to take care of for me. If you don't know anyone willing to make this sacrifice for you, you could use any other appropriately-sized tube. For the tank on my plantation dome, I used a metal tin. You could also use soft drink cans, cardboard postal tubes, or even roll your own out of cardboard or plastic sheet. I used foamcore for the end supports. 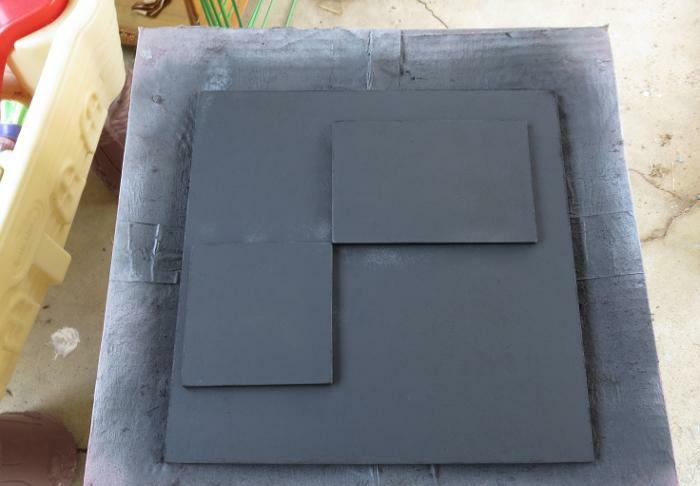 For the uninitiated, foamcore (also sometimes called foamboard) is a craft board that is comprised of a thin sheet of expanded polystyrene foam sandwiched between two sheets of stiff paper or thin card. Because it's lightweight but fairly strong, it's a fantastic material for building terrain. I marked out the shapes that I wanted on the foamcore with a pencil, and then cut them out using a sharp hobby knife and a steel ruler. As I wanted a worn concrete look for the ends, I used the hobby knife to roughly shave away the edges along the top and sides, and then used fine sandpaper to smooth the cut edges of the paper down. 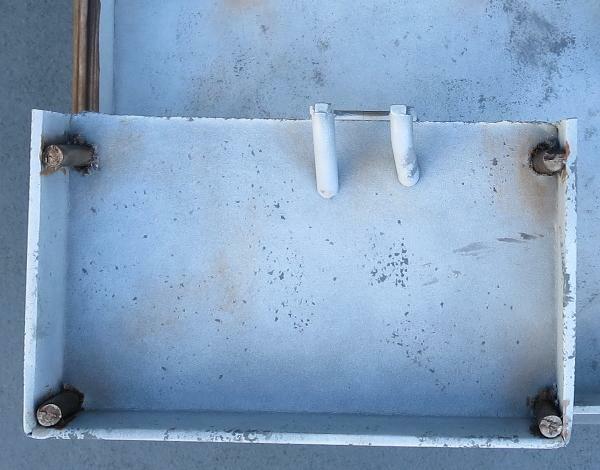 For the access port on the top of the tank, I took the square hatch and corner reinforcing from the Maelstrom's Edge terrain sprue and cut a piece of plasticard sheet to an appropriate size to fit them all on it with a little room to spare for visual effect. I then cut four strips to run around the outside of the top plate. 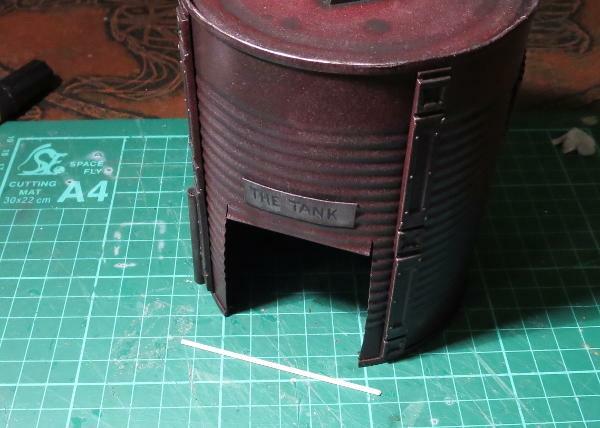 To replicate the curve of the tank for the two strips that would run across it, I positioned the bottom of the Pringles can on the plasticard lined up with the bottom corners of the strip and traced around it with a pencil, and then cut along the resultant arc with my hobby knife. 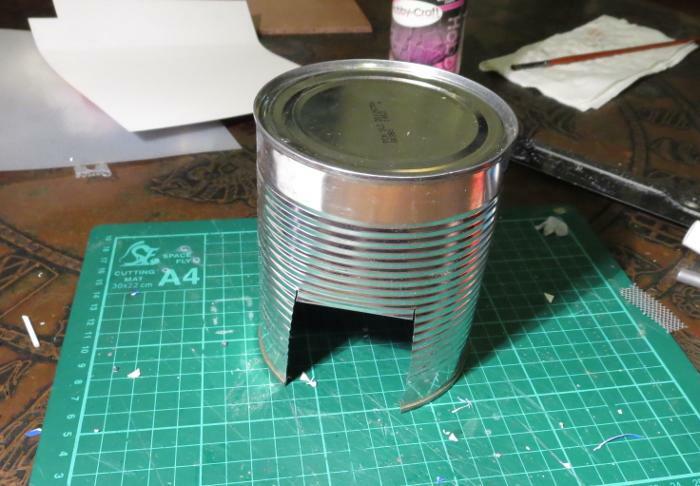 Because the bottom aluminium strip on the can is slightly larger in diameter than the actual can, this doesn't create a perfect fit, but it gets it close enough that you can sit it in place to see where it needs a little shaving with the knife to sit flush. 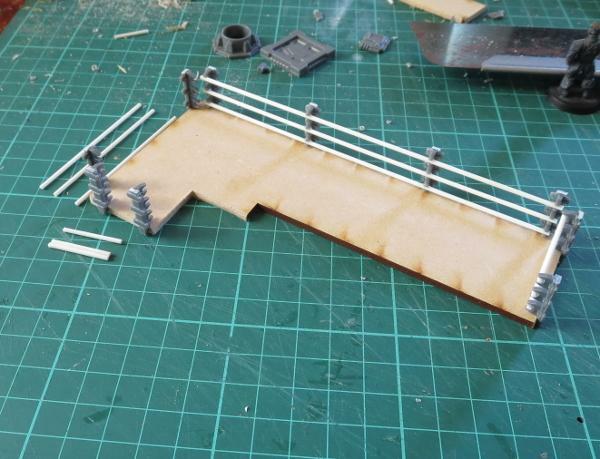 The strips were glued in place with plastic cement, and when that was set I flipped the construction over and glued the terrain sprue components in place as well. 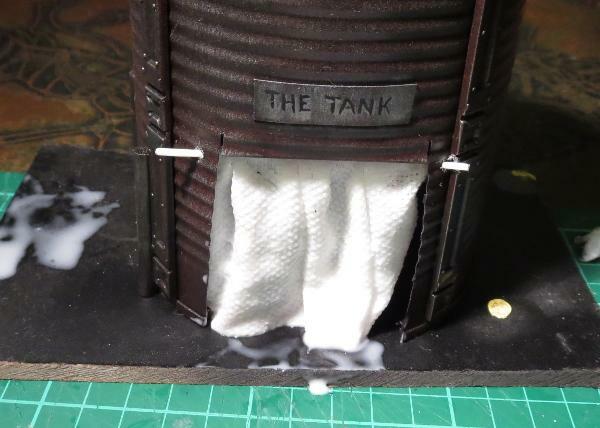 To add a little detail to the outsides of the tank ends, I cut some sections off the long support struts on the terrain sprue, and also assembled a little computer terminal by trimming down the comm panel and cutting a piece off the end of the lintel piece. One end got two of the support strut pieces, and the other end another two strut pieces, the computer terminal and a small pipe fitting, all glued in place with superglue. I then glued the foamcore pieces onto the ends of the tube with superglue. One end of the tube is rolled cardboard, which glues just fine to the foamcore. For the tube's aliminium end, I gave the superglue a little extra help with a primer from an 'all plastics' two-part superglue. A little more superglue was used to stick the access port in place on top. The final step before painting was to paint the exposed foam on the foamcore sections with PVA glue. 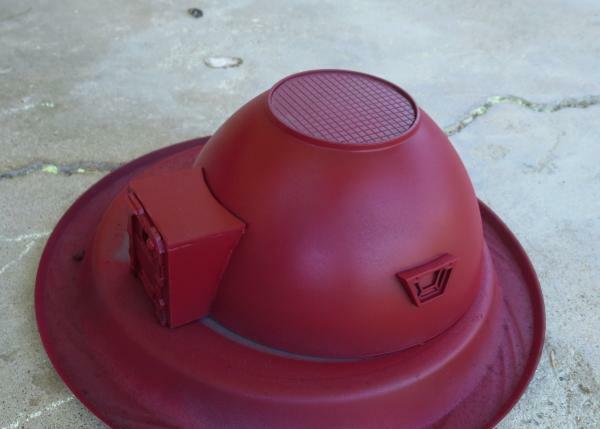 This protects the foam when the base coat is sprayed on, as most spraypaints will partially eat the foam. 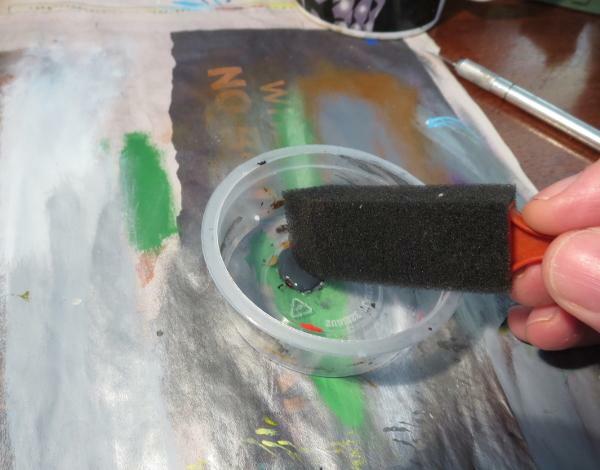 If you're painting with a brush, or with a specific foam-friendly spray, this step is unnecessary. I basecoated the whole tank with a Rustoleum quick-drying grey primer to get a consistent base for painting over, and then hit the tank itself with a spray of Army Painter Dragon Red. I could have saved some repainting here by masking off the ends to avoid overspray from the red, but it didn't really seem worth the bother. I just used a large, flat brush to add another coat of grey (in this case Vallejo Neutral Grey) over the end pieces, added some weathering to the red using a sponge and some Vallejo Heavy Charcoal (you can find my tutorial on sponge weathering here) and added a layer of Vallejo Beasty Brown over the terrain sprue components. Next up, I gave all of the metal parts a generous wash of Army Painter Strong Tone, and put it aside to dry. 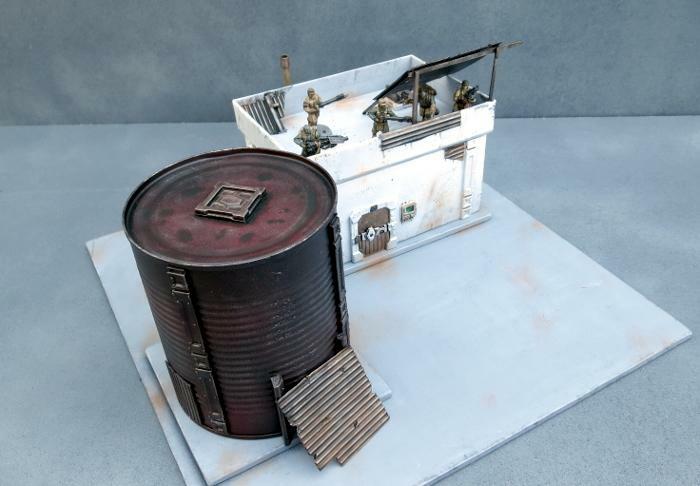 To build your own storage tank, you can pick up the Maelstrom's Edge terrain sprue, or any of the rest of the Maelstrom's Edge model range, from the webstore here. This week, I'm showcasing another terrain build, but for a change of pace I thought it would be fun to build something in a more unusual style. I've been eyeing off the Japanese building range from Plast Craft Games for some time, and in particular a three-level temple that was just screaming to be turned into a table centrepiece. So I grabbed the temple from one of my regular go-to online stores, broke out some Maelstrom's Edge terrain sprues, and set to work! 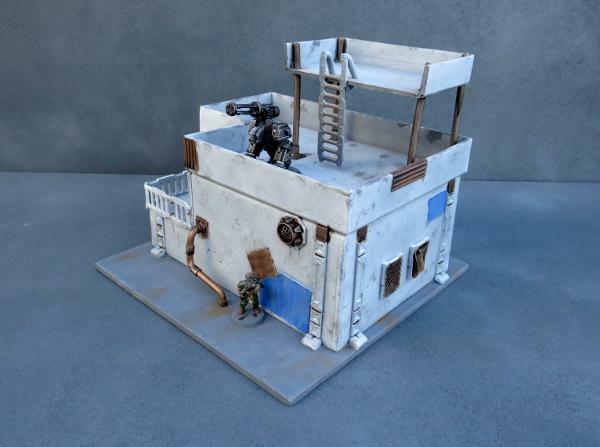 The Plast Craft Games buildings are flat-packed, assemble-yourself-style constructs in a similar vein to the various MDF offerings out there, except that instead of MDF they're made from sheets of die-cut, foamed PVC. This material is somewhere in between styrofoam and plasticard in density, and is nice and easy to work with and surprisingly sturdy once assembled. My plan was to not get too crazy with modifying the building, as I love the general design of it. It just needed some sci-fi-ing up to fit on my table. 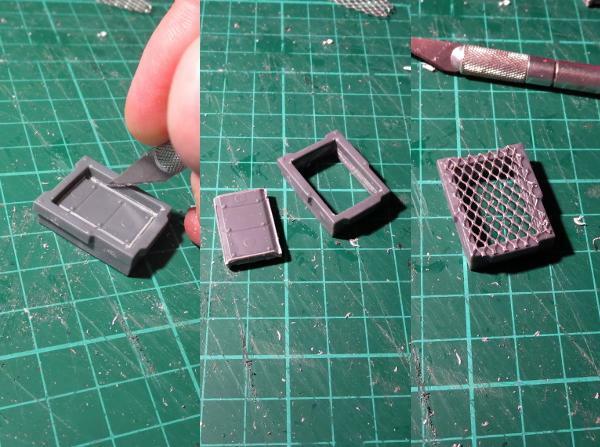 So with that in mind, I discarded the resin screen doors that come with the kit in favour of the single doors from the Maelstrom's Edge terrain sprue. The existing doorways on the temple were exactly the right height for the plastic doorframe, but a little wider, so I filled in the gaps on either side with strips of scrap sheet cut to size. Other than that, the bottom level was assembled as per the instructions. Similar treatment was given to the second level, although this level only has doors in two walls instead of all four. The top level has a smaller doorway in a single wall. Rather than cut out the door hole to fit another full-sized doorframe in there, I filled in the doorway with some leftover sheet bits and glued on the square hatch from the terrain sprue. I also replaced the spire on the roof peak with another square hatch. The railings that came with the temple were a little low, and a little low-tech for my liking, so I replaced them with ladders from the terrain sprue. This required some fudging to make it work, as I discovered when I started gathering ladders that I had run out. Luckily, I was able to cobble together a few discarded cut sections to fill the last of the railing on the second level. It's a little rough if you look too closely, but I can always pass it off as a rushed repair job (those lowest-bid contractors at work!). I wanted to do the bulk of the painting before adding the roof sections, as I figured that would be easier than trying to work around them. So the building was given a basecoat with black spray, and then a top-down spray with grey, leaving the black in the lower recesses for natural shading. I then picked out all the metal parts with Citadel Leadbelcher, before giving them a wash with Army Painter Dark Tone. The balcony levels were painted with Vallejo Neutral Grey and drybrushed with Vallejo Light Grey, and the wall panels were basecoated with Vallejo Heavy Brown and drybrushed with P3 Jack Bone. At which point, it was time to add the roof sections. I'm not sure if it was my slightly rushed assembly, or a flaw in the temple kit, but I found that the roof sections for the two lower levels were actually too short to reach the corner beams. Luckily, I had some corrugated cardboard that matched the card used for the roof almost exactly. Cut to size and with tile-grooves added by 'scoring' across the corrugations lightly with a sculpting tool, they were a close enough match to hold up to all but the closest scrutiny. My improvised roof sections were painted black before gluing in place, and then all of the roof pieces were drybrushed with Leadbelcher and washed with Dark Tone. Finally, I picked out the lights above the doors with a drybrush of Citadel Ultramarine Blue, Ice Blue and then white, and added a masonite base sprayed with grey and white for a quick concrete effect. If I have time later, I may go back and replace this with a tiled slab to pretty things up some more. To pick up the Maelstrom's Edge terrain sprue, or any of the rest of the Maelstrom's Edge model range, visit the webstore here. For other Maelstrom's Edge modeling articles, including tutorials and walkthroughs of a wide range of different building and miniature projects, check out the article roundup here, or for help or advice, or just to share your work, feel free to visit the Comm Guild Facebook page! 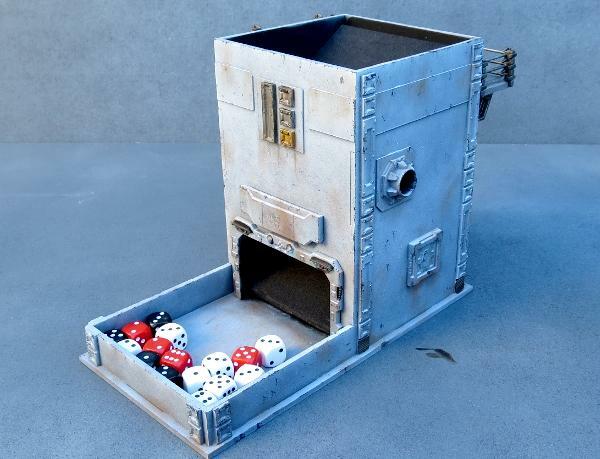 There's nothing worse than throwing a bucketload of dice on the table and having a stray ricochet take out that carefully-painted model sitting perched on the edge of a piece of terrain, or having to launch an expedition under the table when the dice decide to go on an adventure. 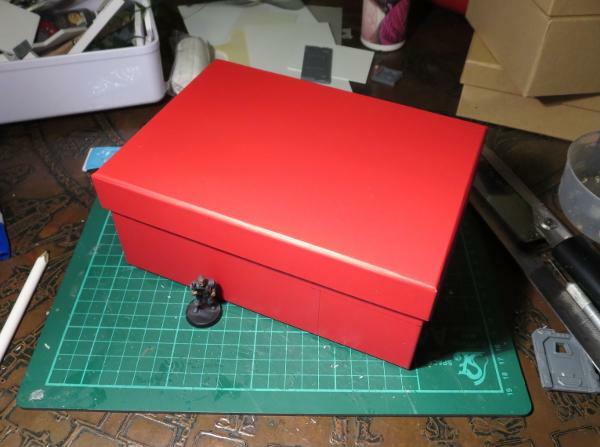 There are a few common solutions to this problem - dice trays, rolling on another table, never painting anything, ever - but this week, I decided to build a dice tower from a Knights of Dice blank and some bits from the Maelstrom's Edge terrain sprue. 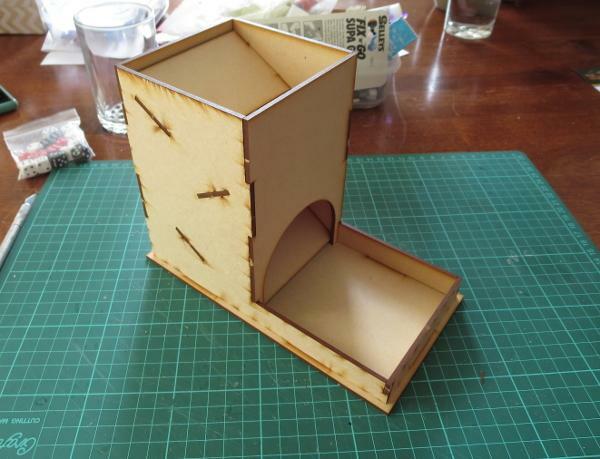 For the uninitiated, a dice tower is a box or tube that has some angled ledges inside. Instead of flinging your dice all over the table like some sort of uncultured barbarian, you drop them into the top of the tower where they roll down from ledge to ledge, eventually rolling out into the tray at the base of the tower where their predilection for wanton destruction is safely contained. I wanted something that would look like it belonged on the table, and so dug out some terrain sprues and tools, and went to work. First step was to pretty up the opening at the bottom. I took a garage door from the terrain sprue, and found that it would fit into the existing arch with some cutting for the top corners, and something to fill in the top of the arch as it was higher than the door frame. So I marked out the door frame against the front wall of the tower, and also marked the scrap piece that was cut from the arch to leave an arc that would fit in above the door. I then used a razor saw and exacto knife to cut the door out of the door frame, and glued the frame and the MDF arc in place in the archway. With a dry fit of the tower, I discovered that the dice were sometimes getting stuck behind the sides of the door frame, as the plastic addition made the opening for the dice narrower than was originally intended. I fixed this by taking a lintel piece from the terrain sprue, cutting it in half, and gluing the two pieces on either side of the doorway, creating a bevel to funnel the dice out the door. One of the less pleasant things about dice towers is that they can be rather loud and echoey when the dice are working their way through. I fixed this by taking some craft foam and cutting it to the size of the ledges, and then gluing it on top. At this point, I also sprayed the interior of the tower black to match the foam. This would also make it relatively unobtrusive on the table. To support the balcony, I cut the sides off two trapezoid windows, and glued them in place on the back wall of the tower. Finally, two ladders and some cut down corner reinforcing pieces made an extending ladder that could be hung from the balcony, fire-escape-style. To add a little extra detail to the front of the building, I made a large Epirian Foundation symbol using pieces from a reinforcing strut from the terrain sprue. With the addition of a few more bits on the sides to hide the ends of the interior ledges, and a sign board made from the cutaway garage door to disguise the filled-in archway, the tower was ready for painting. To avoid getting spray on the interior, I filled in the top and the doorway with some cardboard and a piece of foamcore. 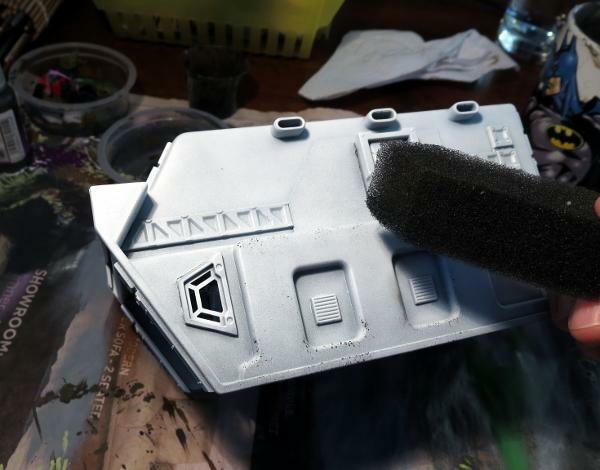 Painting was a quick and easy spray with a grey primer, and then a quick downwards spray with some white to leave the grey in the recesses and shadowed areas. Once the wash was dry, everything was dirtied up a little with a drybrush of Vallejo Beasty Brown. A little detail work here and there, and the tower was ready for the table. Feeling inspired? You can pick up the Maelstrom'd Edge terrain sprue, along with the rest of the model range, from the webstore here. As always, we would love to see your creations on the Comm Guild Facebook page! We can wind up spending a lot of time painting miniatures for our games, so it can often be tempting when it comes time to paint terrain to just slap on a quick coat of spray and call the job a good'un. There are a number of quick and easy ways to add a little more detail (and subsequent awesomeness) to your terrain, though, and the difference it makes on the visual impact during your games is well worth making that little bit of extra effort. With that in mind, I would like to share a simple sponge method for adding chips and weathering to your building paintwork. You will need a craft sponge - something fairly soft and fine-weave. 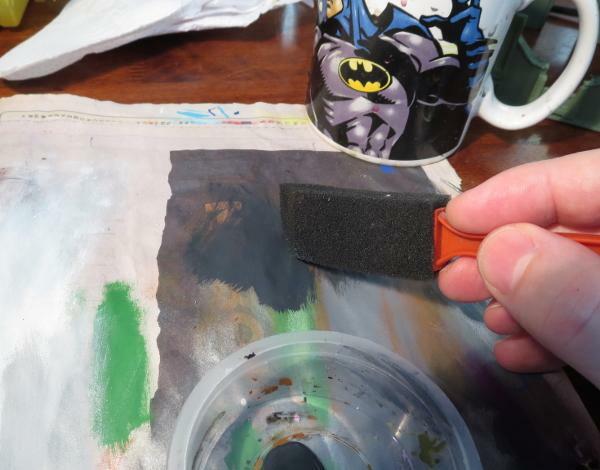 I like to use a painting sponge like the one pictured below, as the pointed tip helps to get into difficult corners where necessary. You will also need something to put some paint in or on, some newspaper or paper towel, and (obviously) some paint. 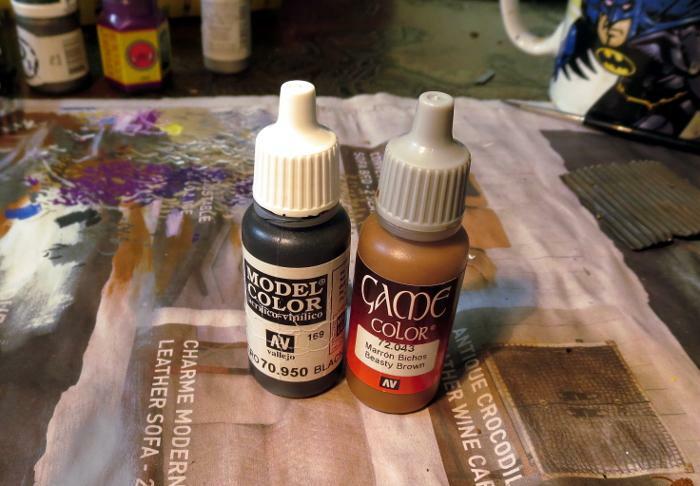 This method looks best when applied as dark chipping over a lighter shade of paint. I tend to use Vallejo Heavy Charcoal as a bit of a catch-all. It's darker than most of the colours I use on my buildings, and is indeterminate enough to cover for cement or aged metal. I avoid metallic paints for this sort of weathering, as they can look a little weird unless they catch the light just right. If you want some metalic touches, you can always use a dark grey and then highlight the bigger patches of chipping with a little metal colour. 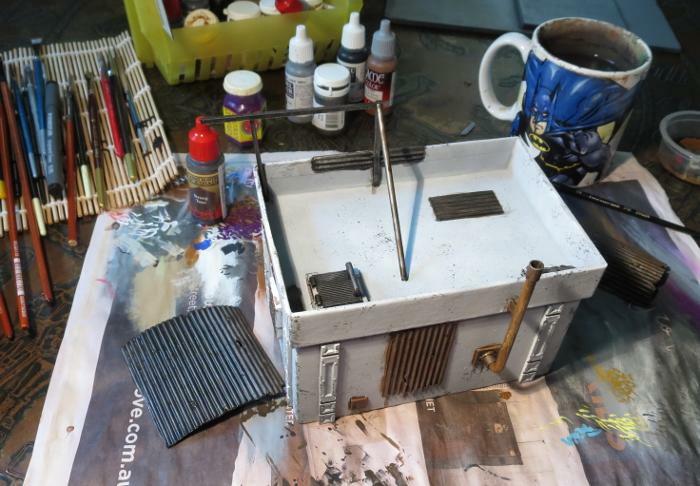 The weathering is applied once you have the basic colour and any higlighting done on your building, and the process is really simple - Drop out some paint onto whatever palette you are using and dip the tip of your sponge in the paint. Rub the sponge on the paper to remove any excess paint. You want the sponge to be wet, but not have any gloopy patches of paint. 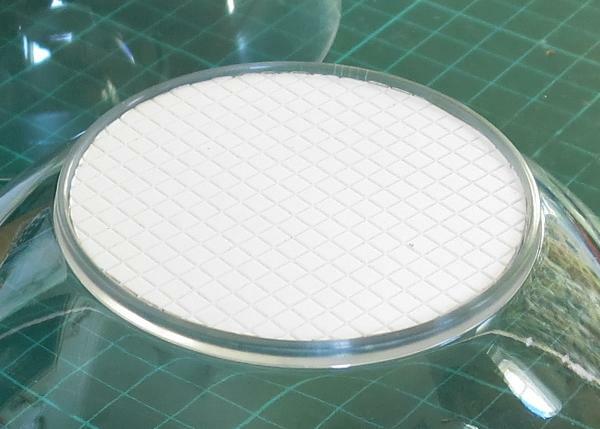 If in doubt, press the sponge against a clean section of the paper and check the result - you're aiming for small specks of colour, not big blobs. Press the sponge onto your terrain, using a straight up and down motion. You want to dab the paint on, not brush it. Experiment with turning the sponge different ways and using different amounts of pressure to vary the way the chipping is applied, reapplying paint to the sponge as necessary. Apply heavier weathering to places on the terrain that would naturally get knocked or abraded more, like protruding corners of walls or the edges of doors and windows. Keep going until you have worked over the whole building. Here's the same thing on a green building. 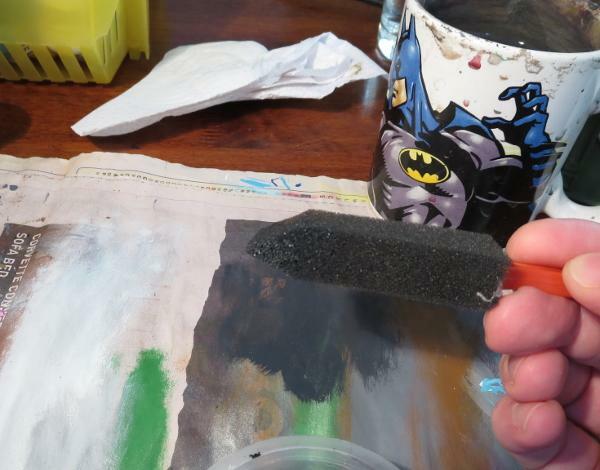 If the sponge starts to get tacky with drying paint, you can wash it out, squeeze out as much water as you can, and then squeeze it between a couple of sheets of paper towel to get it as dry as possible before going back to the paint. Once you're happy with your chipping, you can add other details or weathering as required. 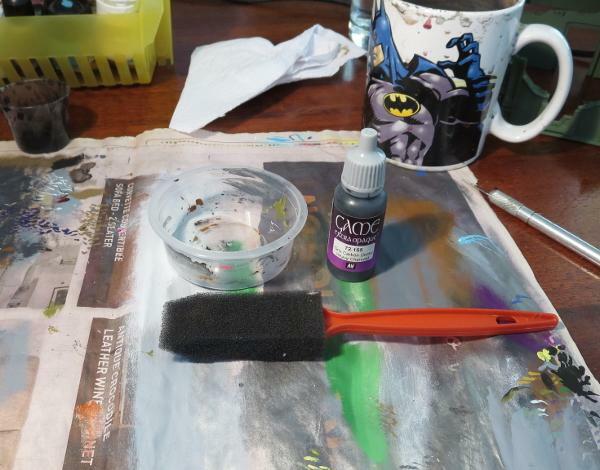 A strategic drybrush of brown in high-traffic areas, or just here and there for a bit of added grime, can go a long way to complete the weathered look. You can find the Maelstrom's Edge terrain sprue along with the rest of the game range in the webstore here. As always, we would love to see your creations on the Comm Guild Facebook page! Throughout the galaxy, few structures hold up as well in hostile environmental conditions as the humble dome. They're durable, efficient, and as a bonus look nice and distinctive in a universe filled largely with pre-fabricated, angular structures. 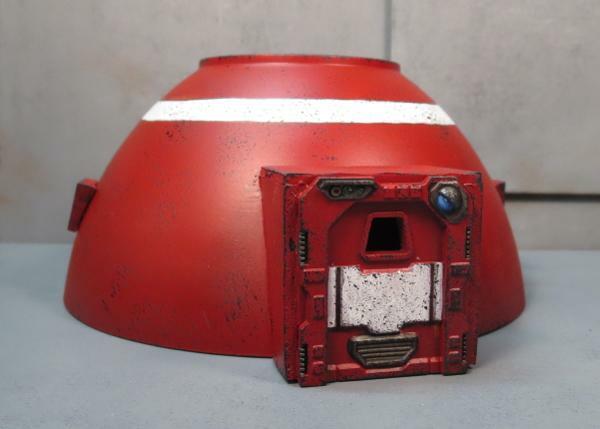 So here's a simple way to make yourself some small dome structures for your gaming table, using components from the Maelstrom's Edge terrain sprue, a little foam core board, some plasticard, and a plastic bowl. As with the larger plantation dome that I made a while back, the basis for this building is a plastic bowl, in this case picked up in a pack of 8 from a local discount store for a couple of dollars. 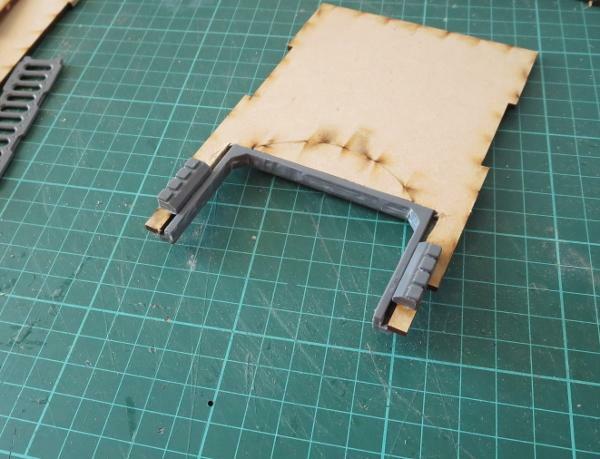 I cut two rectangles of 5mm foam core board, about 30mm wide and the same height as the inside frame of one of the small doors from the terrain sprue. These formed the sides of the building's entrance, and so would need to be curved on the back sides in order to sit flush with the side of the dome. Sitting one of the rectangles against the bottom rim of the dome, I measured the distance between the top corner and the dome, and marked that distance along the short edge of the foam core. 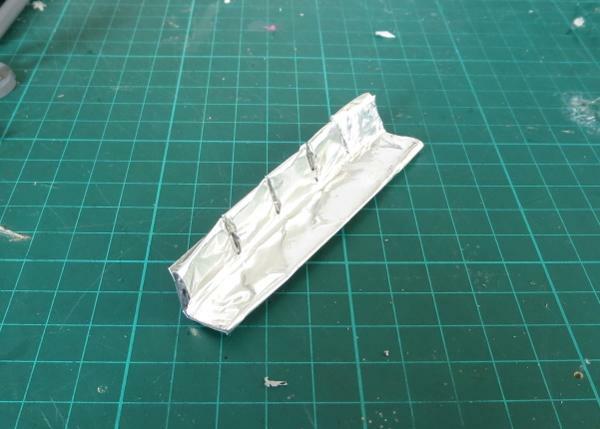 I then folded a piece of aluminium foil to made a long L-beam shape. With a pair of clippers, I made a series of cuts along one edge. The uncut surface of the beam was then pressed against the side of the dome, with the cuts allowing it to bend to match the shape while the L-beam shape gave it enough rigidity to keep the curve when removed from the dome. 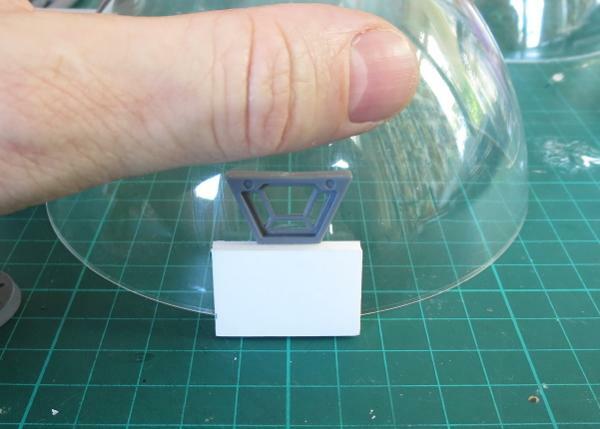 I then used the resultant curve to transfer the shape of the dome to the foam core, matching the foil beam up to the measured mark and the corresponding bottom corner of the entrance wall. 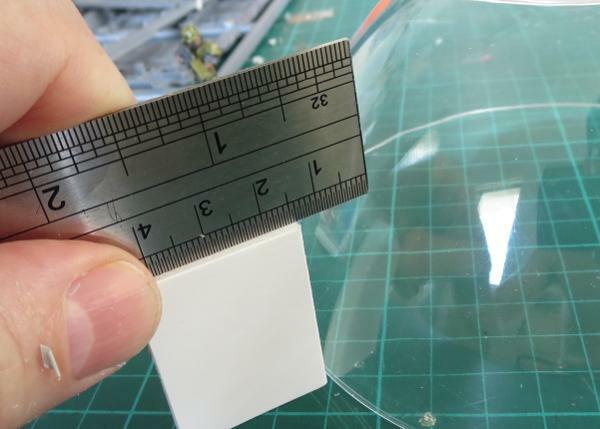 With the addition of a piece of 1.5mm plasticard, cut to shape for the roof, the entrance tunnel was glued together and test fitted against the dome, with a little fine-tuning of the curve with the exacto knife allowing it to sit flush. I wanted a little texture on the flat top of the dome, so I decided to use some grid-patterned plasticard. 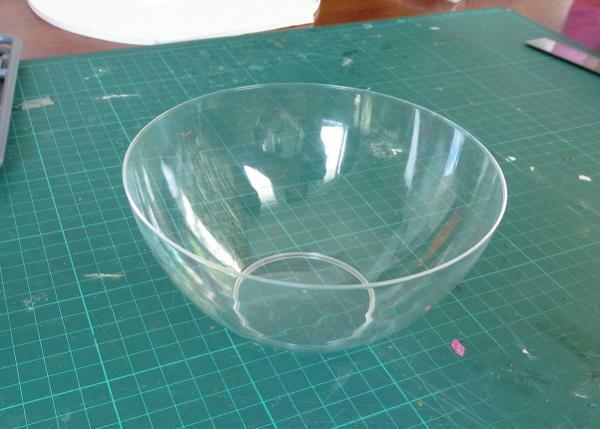 Not having a compass handy, I found a small drinking glass that fit neatly into the circular base of the bowl, and used this as a template to draw a circle on the plasticard. Once cut out, this circle was glued neatly into the recess. 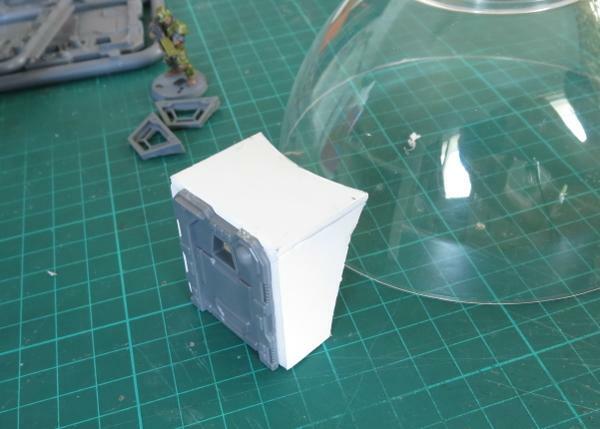 For the windows, I took the trapezoid windows from the terrain sprue and trimmed down one side to help them sit almost vertically on the side of the dome. To glue the windows in place, I grabbed a small offcut of foam core to use as a spacer, to ensure that the windows on either side of the building sat at the same height. 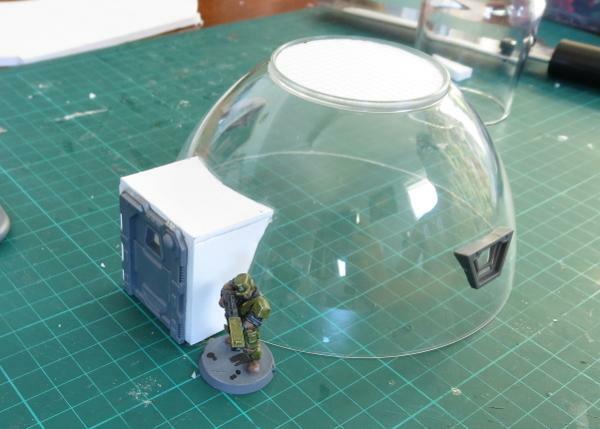 Because the dome is transparent, I sprayed a coat of primer inside to begin with. That way, if the outside of the dome gets a little scratched up from gaming use, it would show grey instead of clear. The outside was then also primed grey. The primer was followed with a coat of Army Painter Dragon Red. I added a white stripe to break up the red a little, and painted some metal detail with P3 Pig Iron. 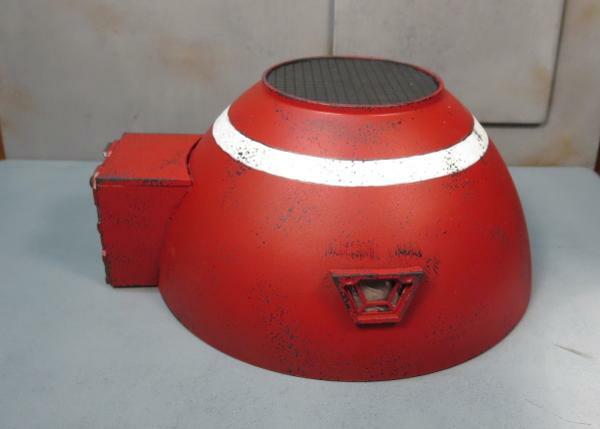 Finally, some sponge weathering and the roof tiles painted with Vallejo Heavy Charcoal, a quick wash with Army Painter Dark Tone for the metal parts and the roof, and some colour on the lights above the door, and the minidome was finished! 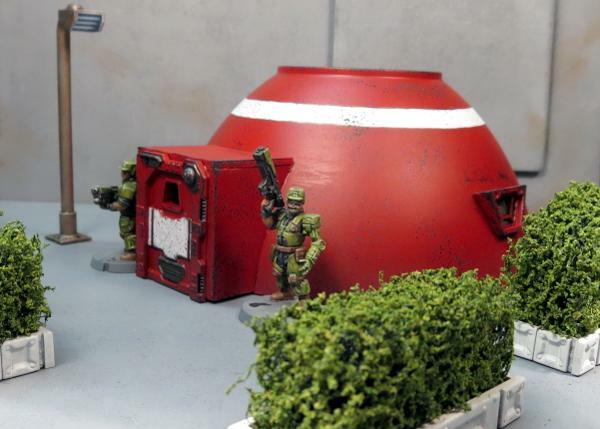 To build your own mini hab domes, you can pick up the Maelstrom's Edge terrain sprue along with the rest of the Maelstrom's Edge model range from the webstore here. As always, feel free to share your creations on the Comm Guild Facebook page! To start with, I took a length of plastic rod and cut it to run across the doorway with a little overhang on either side. This would eventually sit in place at the top of the doorframe, poked through a couple of holes drilled into the tin on either side. 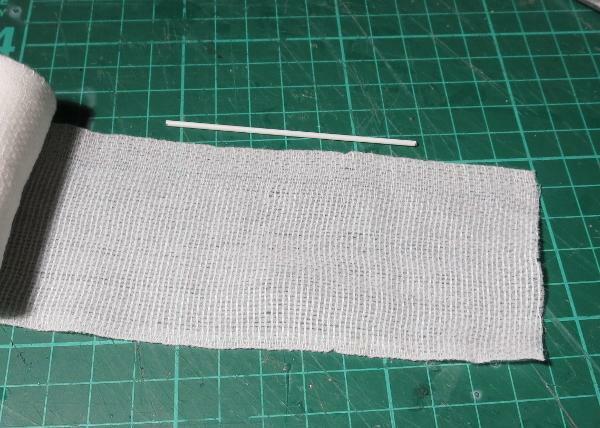 I then grabbed some crepe bandage and cut a piece a little longer than the rod, to allow it to bunch up. Bunched curtains look more interested than a flat sheet, unless you want to paint a design on, in which case a flatter surface is going to be easier to deal with. Next I glued the bandage over the rod with some superglue, bunching it up so that the ends of the rod were sticking out, and folded over the rod far enough so that the bottom of the blanket would just touch the ground when hung in place. 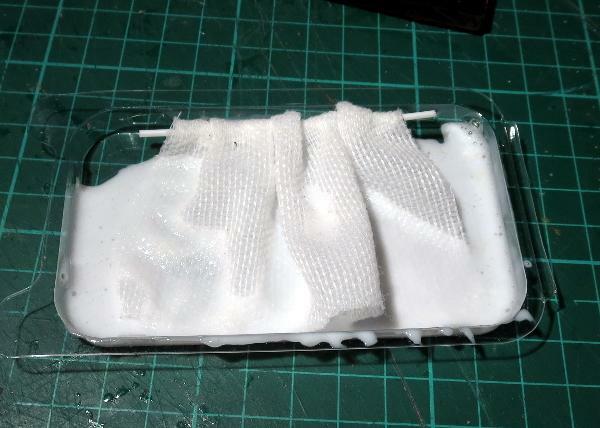 Now comes the messy part - I mixed up some PVA glue with a little water. The exact amount of water is going to depend on how runny your PVA glue is, but you're aiming for around the consistency of pouring cream. 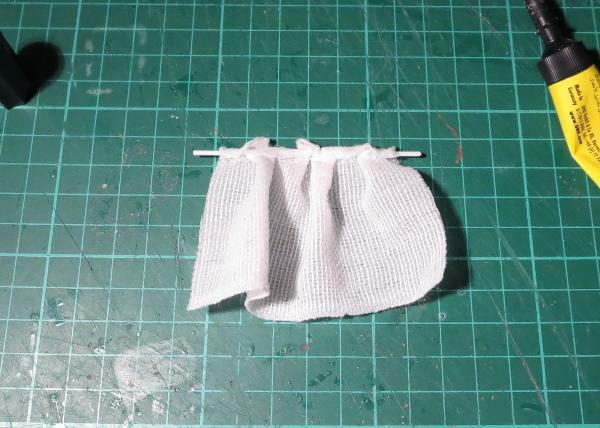 Then I dropped the bandage blanket in the glue and let it soak right in. When the glue dries, it will stiffen up the cloth, so you want it good and soaked through. If the glue is too thick, it doesn't soak in as well and you wind up with some parts of the blanket that are still soft and floppy, and others a goopy mess. Once the bandage was nice and gluey, I hung it in place and arranged the folds to look as natural as possible, and then left it sit for two days to give it plenty of time to dry. Once dry, it will be stiff, but still slightly flexible. If it's too soft and doesn't hold its shape, you can stiffen it up a little more by painting on some additional glue, but try not to put it on too thick and fill up the weave of the fabric. 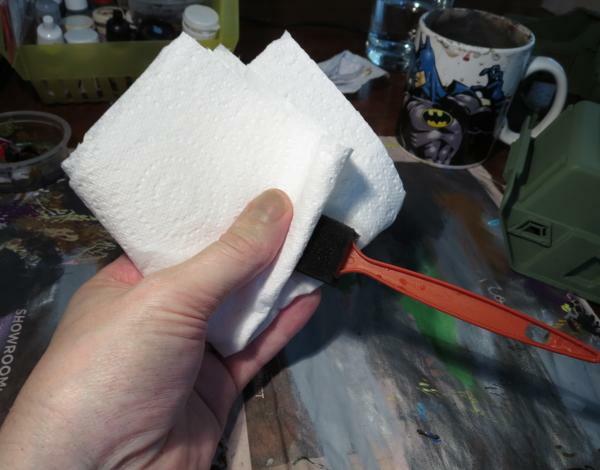 If you have a brush-on superglue, you could also paint some of that onto the back of the blanket if it is accessible, but again, be sparing so you don't soak it into the weave and destroy the blanket look. When the glue is properly dried, it's time to paint. 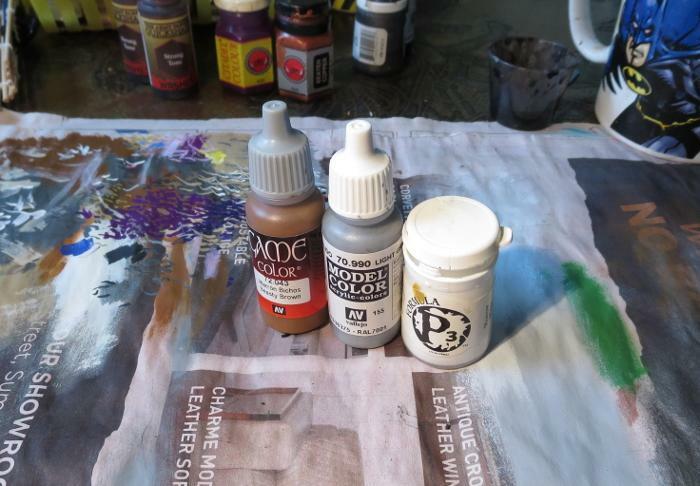 I started out with a layer of Army Painter Strong Tone, but you could use whatever colour fits your terrain. 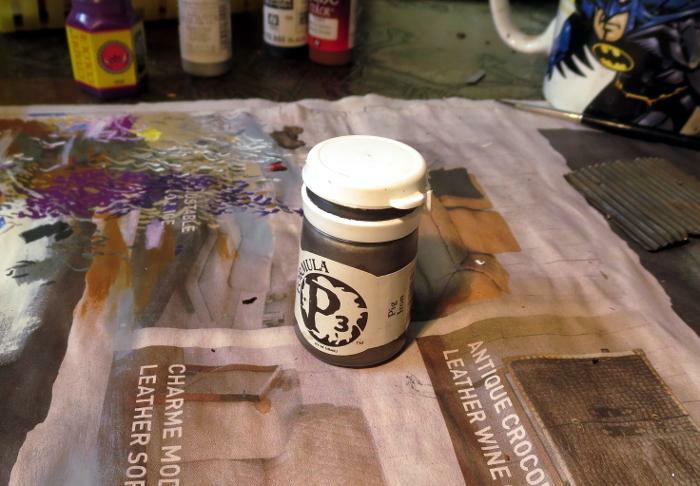 If you use a wash or ink, make sure you give it plenty of time to dry, as the watery paint can cause the PVA glue to soften up again. Once the wash was dry, I carefully drybrushed with some bone and white to highlight the raised parts of the blanket, and added a little more wash into the deeper creases for some extra shading. And that's a job done! The same was done here to hang a blanket inside this door frame. 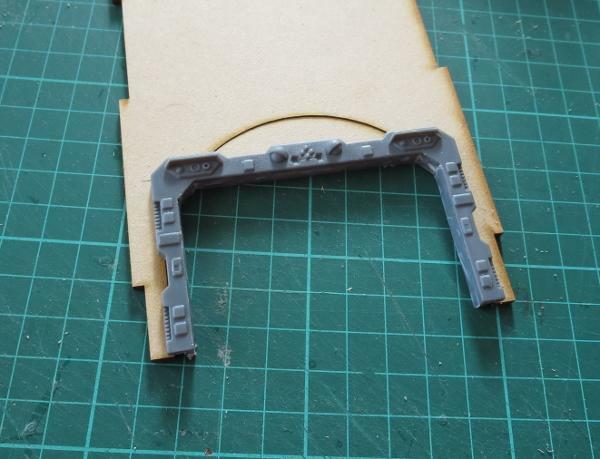 This is a door piece off the Maelstrom's Edge terrain sprue with the door cut out of the frame. The blanket is superglued in place at the top corners and down the sides of the door frame and then shaped and left to dry. On my next terrain project, I'll also be using this to add some canvas roof coverings to a building that's seen better days... Stay tuned! To build your own stellar refugee settlement, you can pick up the Maelstrom's Edge terrain sprue along with the rest of the Maelstrom's Edge miniature range from the webstore here. As always, feel free to share your creations on the Comm Guild Facebook page! This week, I'm continuing on with the construction of the Broken settlement that I started a few weeks back, which you can find round about here, by adding in another 'renovated' building and a converted water tank shelter. 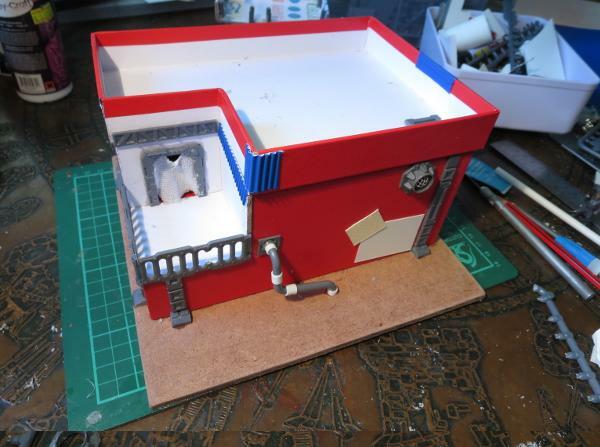 I fast-forwarded a little on construction by grabbing a small building that I made some time ago for a video showing how to make a building from a cardboard gift box and the Maelstrom's Edge terrain sprue (which you can find on Youtube here). 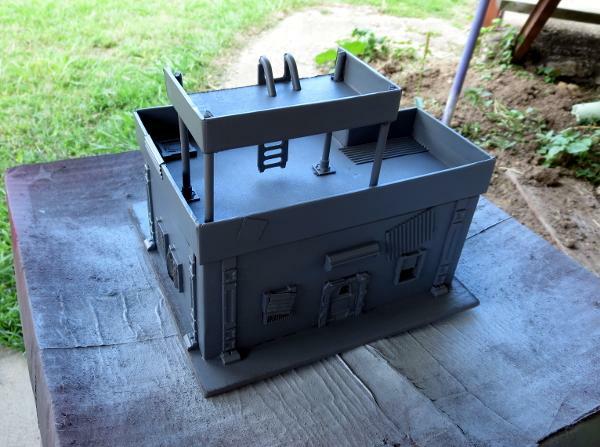 This was partly painted as a test run for the sponge-weathering that I used on the first building for this settlement. Clearly, this building was still far too pretty looking to fit into a Broken settlement, so I added a bunch of patch-plating using plasticard and corrugated cardboard, and added some mesh over the windows on the sides. I also built a framework on the roof to create a makeshift shelter or sentry point. The companion building for the gift box one is made from an old fruit tin. This received a good wash and had the label removed, and then I cut a squarish hole in the side to serve as a doorway. 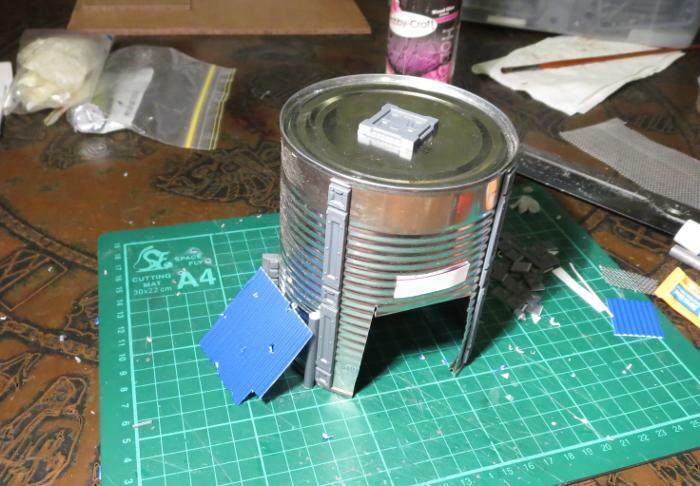 I cut a bunch of reinforcing struts from the terrain sprue to fit neatly down the sides of the tin. 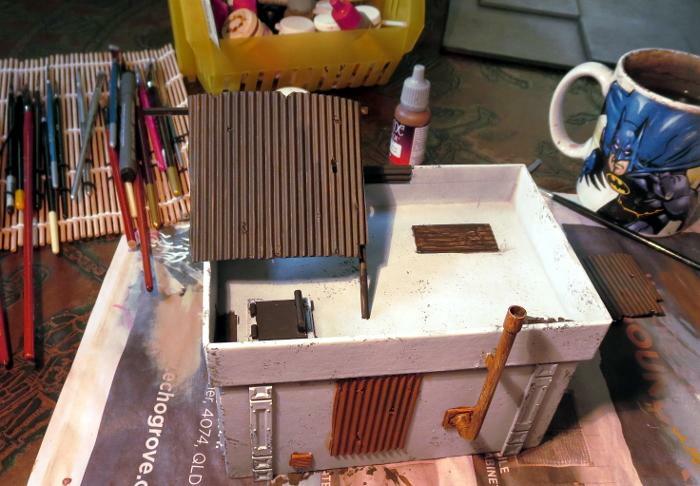 With the addition of some patches, a hatch on the roof and a lean-to on the side, the old tank was ready for painting. 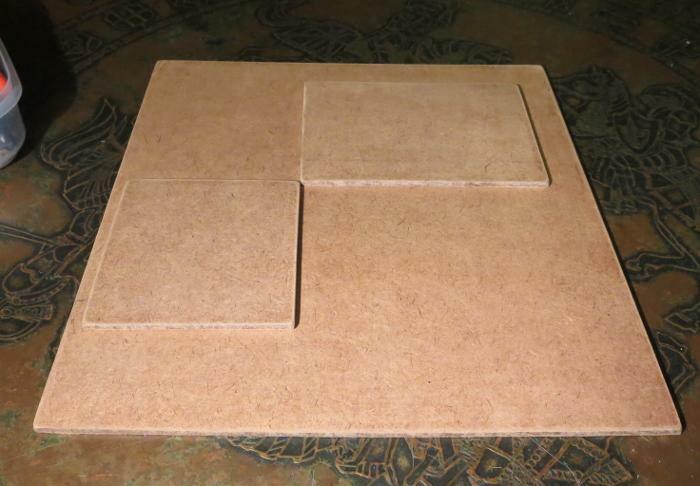 To sit the buildings on, I cut a 12" square of masonite, with a couple of smaller pieces glued on top - a rectangle for the gift box building and a square for the tank. These were cut to size and then sanded around the edges to smooth down the burrs. I then gave the top surface a light sand to break up the shine and give it some texture for drybrushing later, and then glued the building foundation pads on with PVA glue. 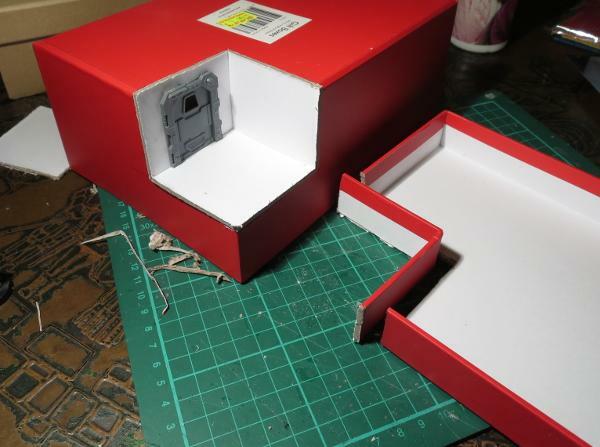 Because the gift box building was already mostly painted, I could skip straight to the detail work. To check how the main bit was done, check out the first article linked back up at the start of this one. The various metal patches were given a coat of a rough mix of Vallejo Beasty Brown and black. Over this went a light drybrush of P3 Pig Iron. This was followed by a generous coat of Army Painter Strong Tone. 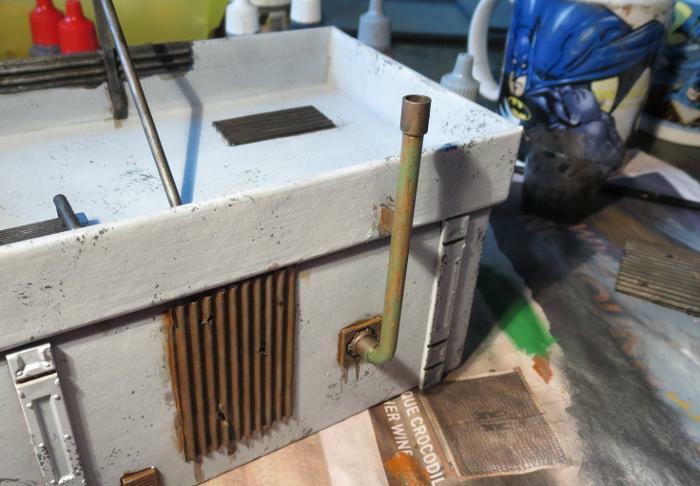 The pipe on the back wall was painted with a coat of Citadel Beaten Copper, and then given a light drybrush of Vallejo Sick Green. Meanwhile, the tank was given a spray inside and out with black Rustguard, to prevent it from rusting through the paint down the track. 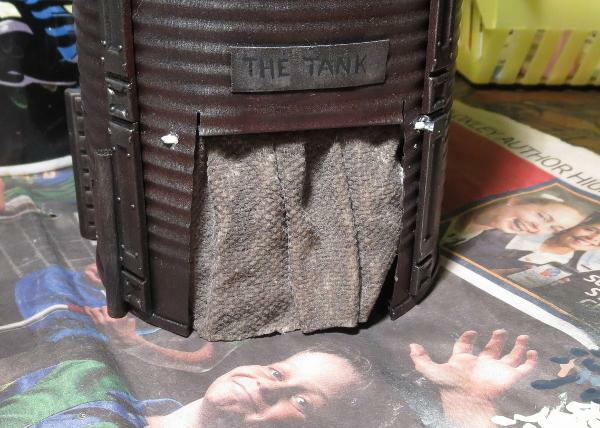 I then masked off the detail parts of the tank building with some masking tape. The came a coat of Rust-oleum Oil Washed Bronze. 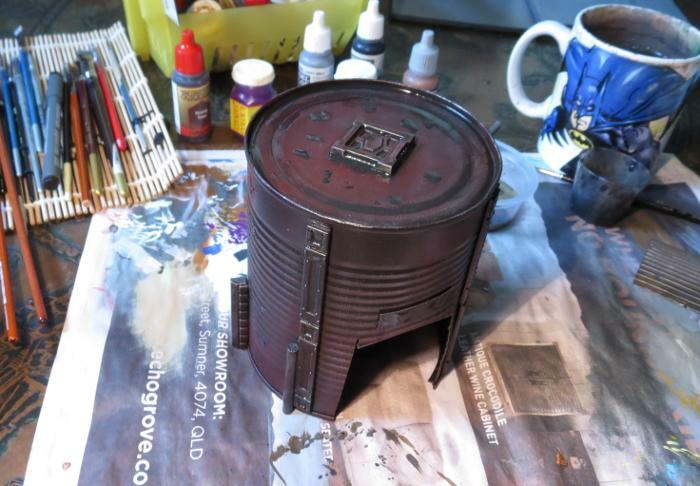 This is a rust-preventing primer like the black, so could have actually gone straight over the bare tin without the layer of black, but I wanted to make sure it was good and dark. The black base helps this without having to spray the bronze on too heavy, as it gets a bit goopy and rough. 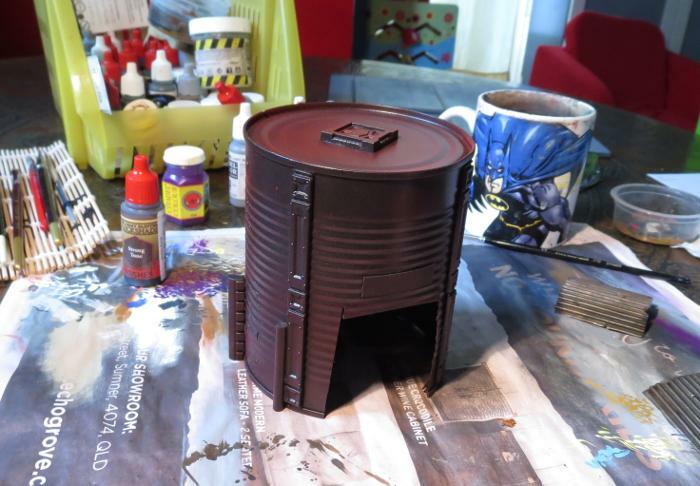 When the bronze was dry, I sprayed lightly over the top surface of the tank with some Army Painter Dragon Red, and then flipped the tank upside down and sprayed lightly around it so that the red caught in the undersides of the tin's corrugations without coating the whole thing in red. I then drybrushed the whole thing lightly with Pig Iron, going a little heavier on the detail parts to make them stand out a little from the darker tank. The detail parts were then washed with some Strong Tone, and a few puddles of Strong Tone scattered around on the top surface. While all of this was going on, I undercoated the based board with some flat black, and then gave it a coat of a flat medium grey. I deliberately use a range of different greys to basecoat my 'concrete' terrain bases, to help reduce the uniformity of the vast expanse of concrete on the table. 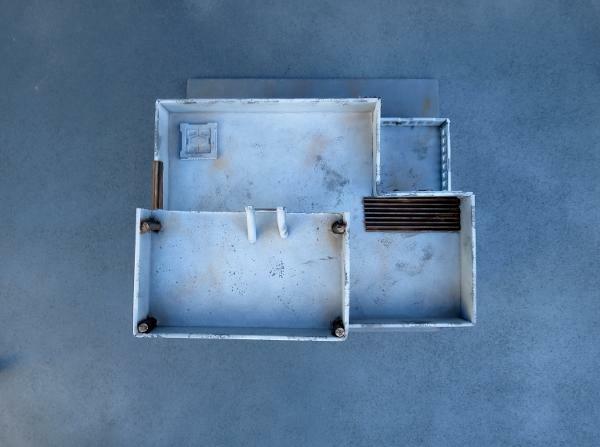 If you look around in a city that has a lot of concrete structures, the colours vary considerably depending on the age of the concrete and the specific mix used, so it creates a better sense of realism on the gaming table if you carry this across in your painting. 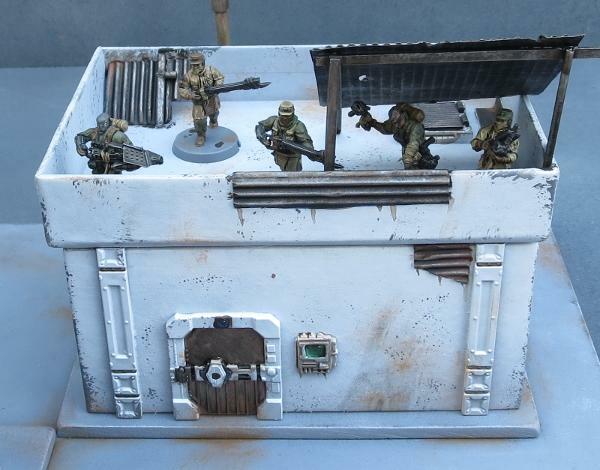 To finish off the base, it was given a drybrush of Vallejo Light Grey mixed roughly with white, and then some patches of worn grime were added with a light drybrush of Beasty Brown, on both the base and the gift box building. With the addition of a couple of final details (some lettering above the tank's doorway, the light above the door and the comm panel screen), this little building cluster is about done for now. 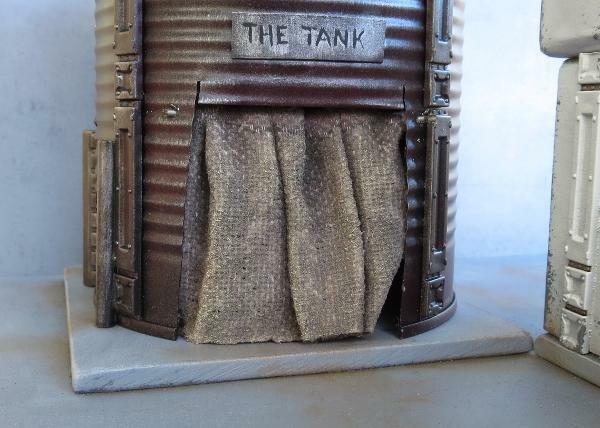 The tank still needs a blanket door covering, which I'll be going through in an upcoming tutorial, and I will go back over all of the buildings in the settlement to add some more characterful detailing once I have some more of the bulking out done, but it's at a point where it's not going to look out of place on the table as-is. Aside from the door covering for the tank, I'll be moving on to another building section that will have some challenges in the roofing department and some sort of interesting detail in the courtyard. To build your own stellar refugee settlement, you can pick up the Maelstrom's Edge terrain sprue from the webstore here. As always, feel free to share your creations on the Comm Guild Facebook page! With the release of the Broken adding a long-awaited third faction to the Maelstrom's Edge universe, it seemed fitting to take a break from tinkering with the shiny new models to add some appropriate terrain to the table. So this week, I broke out some gift boxes that I had waiting for an opportune moment, grabbed some terrain sprues and got to work! 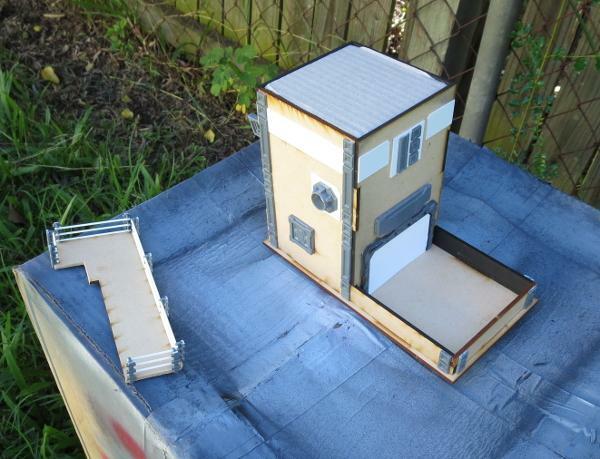 The core of the first building for my new Broken settlement is a 20cm x 15cm cardboard gift box. The plan was to more or less follow the style of my earlier gift box buildings, but with the addition of some faction-appropriate wear and tear and rough repair work. 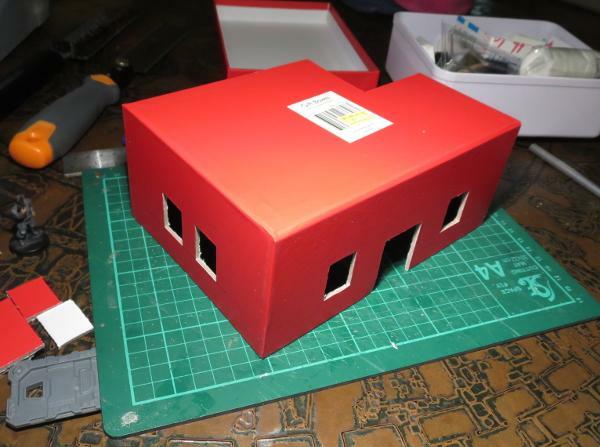 I started by cutting out holes in the box for windows and doors, using a sharp hobby knife. 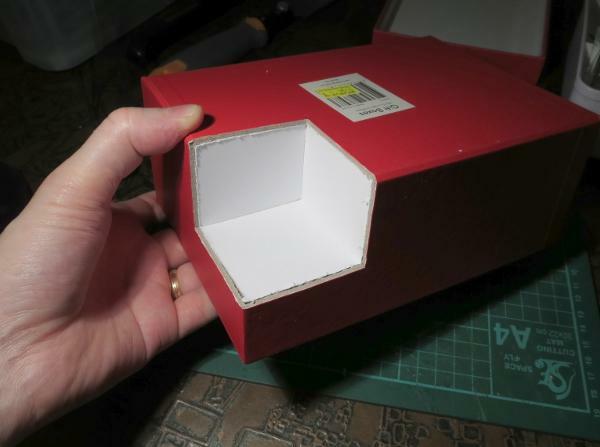 To break up the box shape a little, I cut away one corner of the box, 6cm along each side. Flipped over, this corner piece fits back in place as a recessed balcony. I cut a hole in one wall of the balcony to add a door, and cut a matching corner off the box lid, which would form the walled roof of the building. From there, it was time to glue the box onto a square of masonite, and start detailing. 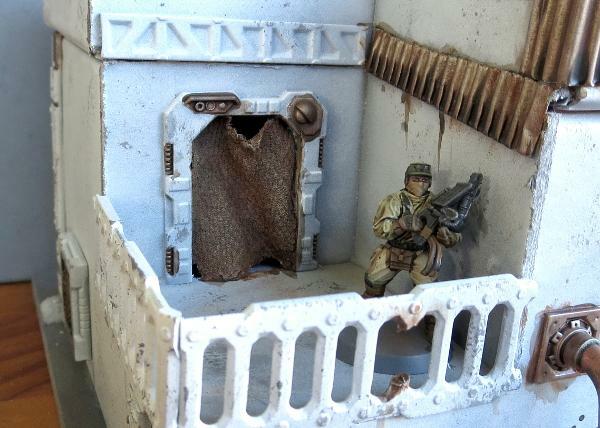 To make the building look like it had been through some rough times, I modified the rectangular shutter windows from the terrain sprue. For the first one, I carefully cut out the shutter using a hobby knife, and then glued some aluminium mesh over the front of the window frame. Rather than making all of the windows the same, I made different modifications to the other windows. 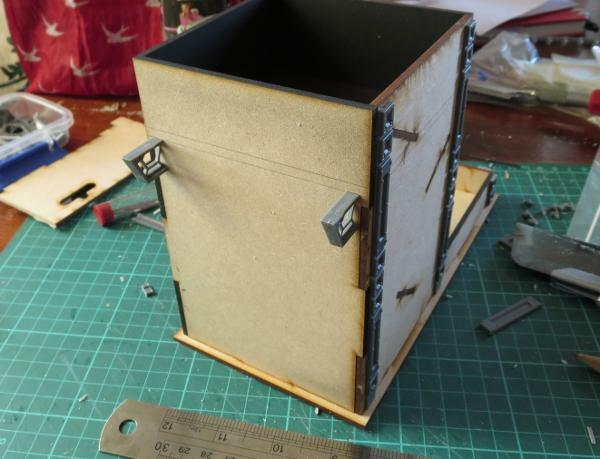 On one, I glued some plastic flyscreen and a square of corrugated cardboard over the front of the frame, another had the shutter replaced with a piece of crepe bandage soaked in watered-down PVA glue, and on the last one I cut away just the lowest section of the shutter. 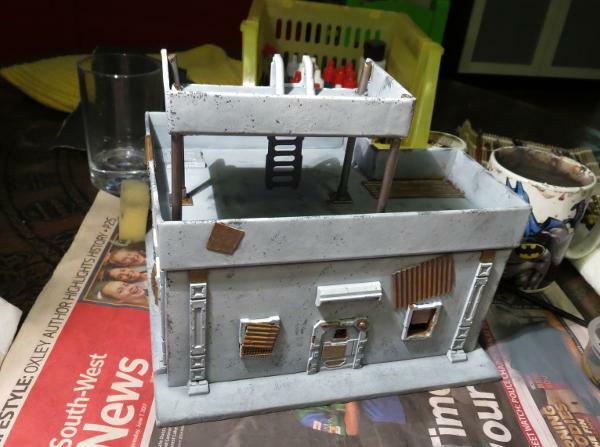 The terrain sprue parts were glued in place with superglue, and then I added some patches cut from thin plasticard and corrugated cardboard to the walls of the building. The door on the balcony received a blanket in place of the original door with another piece of glue-soaked bandage, and a couple of ladders were used to create a railing. A pipe made from pieces of sprue joined with some plastic tubing and a vent made from a large pipe fitting with some aluminium mesh glued inside finished off the detailing on the back. The building was still looking a little boxy, so I decided to break up the silhouette a bit more with the addition of a watchtower on the roof. This was constructed from a piece of gift box lid left over from a previous project, and some pieces cut from the ends of the terrain sprue. The ladder was glued in place with another couple of sprue pieces forming the hand grips at the top. With construction complete, it was time to break out the paint. I started with a base coat of flat grey. Over that went a thin layer of flat white. I didn't want this to be perfectly smooth and pristine, shining white, so kept the coat thin enough for the grey to show through a little. 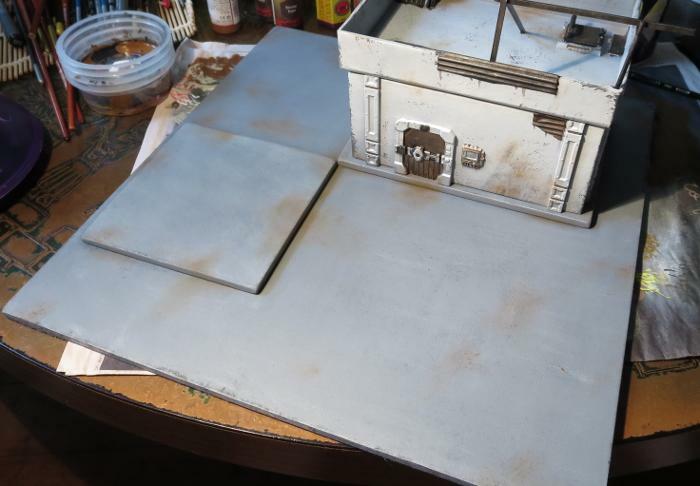 Once the spray was dry, some weathering was added with a sponge and some Vallejo Neutral Grey. The metal patches and any other parts that I wanted bare metal were painted with a coat of Vallejo Beasty Brown, and then given a rough coat of P3 Pig Iron. 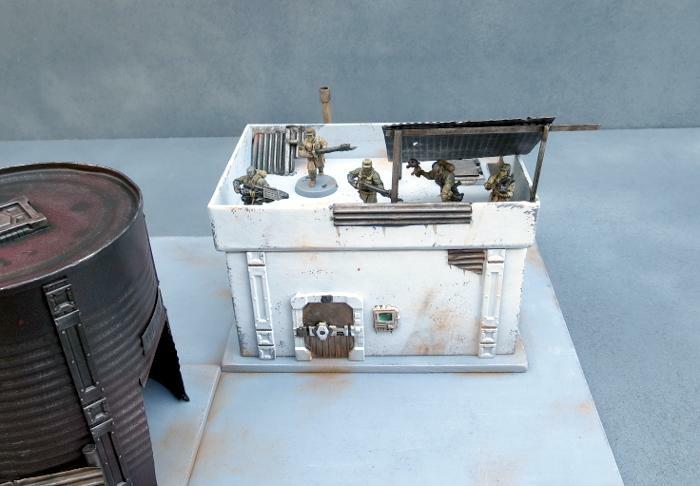 The base was painted with a coat of Vallejo Neutral Grey, and then a drybrush of Vallejo Light Grey, with some patches of Beasty Brown added to dirty things up a little. 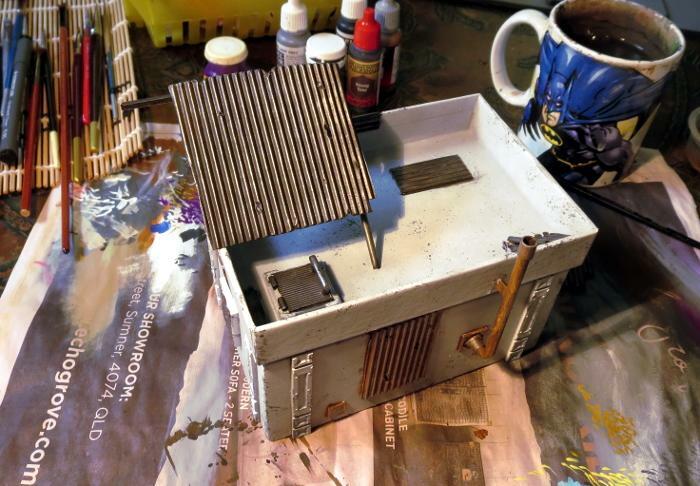 A splash of Army Painter Strong Tone over the metal bits and blankets, and a rough coat of Citadel Ultramarines Blue over a couple of the metal patches, and the building was pretty much table-ready. There is still a little detail work to go, but some of that will wait until I get some more of the settlement completed so that I can match details across the different buildings to tie everything together. I will be adding a couple of smaller gift box buildings with some varying levels of damage and delapidation, and I have some plans for a large peach tin that was rather conveniently opened the other day. The outsides of the buildings will gain some awnings and banners and the like, and I'll scatter some scrap around to add some flavour (and also some handy cover). 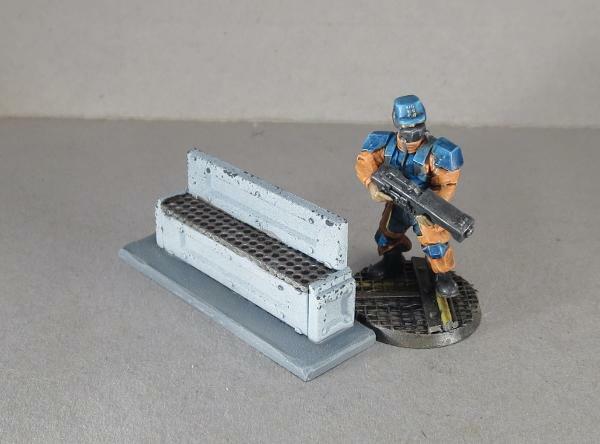 To build your own stellar refuge settlement, you can pick up the Maelstrom's Edge terrain sprue from the webstore here. As always, feel free to share your creations on the Comm Guild Facebook page!